(Amesbury) The stars were out and so was the sun screen as (#2 seed) Amesbury defeated neighboring Newburyport, 11-1, in the Division 2 North quarterfinals at toasty Amesbury on Saturday afternoon. Impressive win for Amesbury (19-2). They will play again on June 5th (Wednesday) in the D2 North semi-finals. Good news for Amesbury today was that Tewksbury took out #1 seed Danvers. 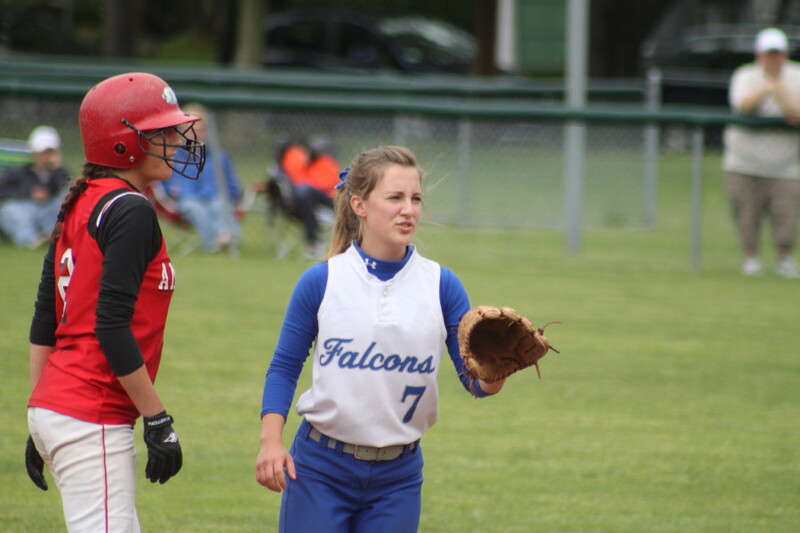 Last year in the tourney, the Falcons ended Amesbury’s season, 2-1, at Danvers. (1) Pitcher Carolina Merrill – Gave up an unearned run in the first and survived a bases loaded jam in the second. The Amesbury senior then retired 16 of the last 17 Clippers she faced. 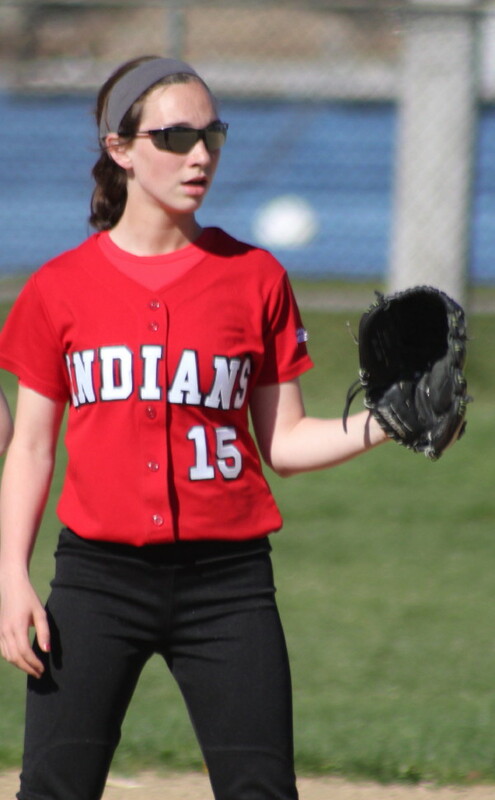 (2) Shortstop Amanda Schell – Had 3 RBI, 3 hits, and 3 runs scored and flawlessly handled six chances in the field. 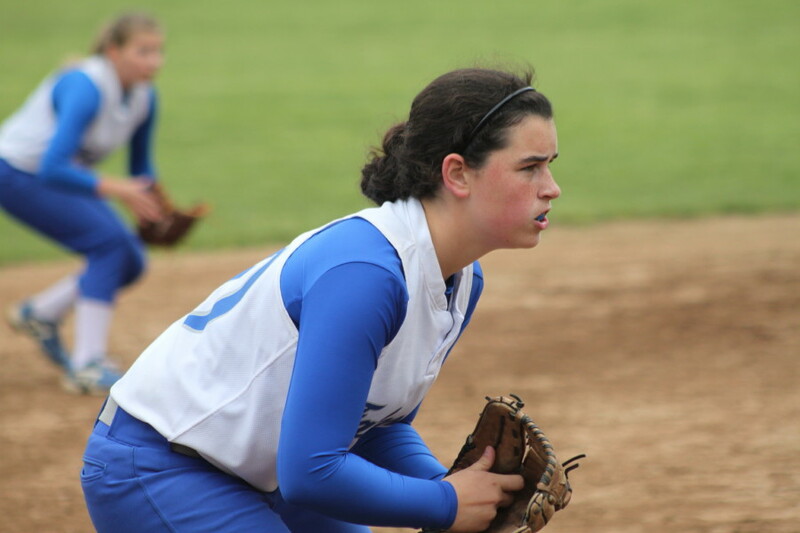 (3) First baseman Erin Leary – Had a hit, an RBI, and scored a run. 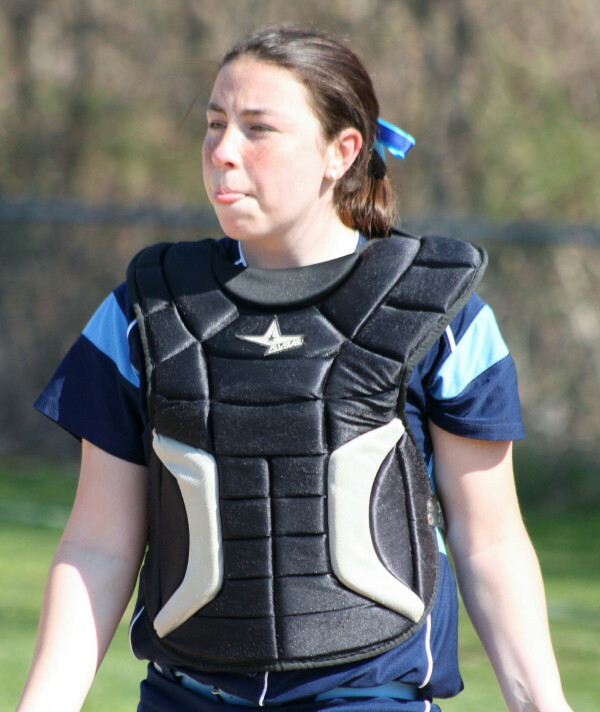 (4) Catcher Cassie Schultz (D2 CAL POY) – Had three hits and drove in three runs. 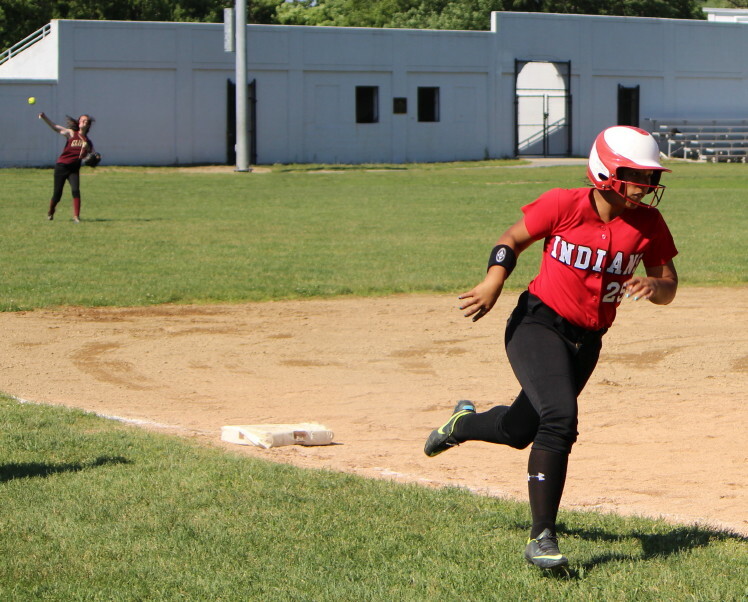 (5) Leftfielder Ashley Valme – Had a two-run homer that reached the stadium wall beyond leftfield. Newburyport had been blown out by Amesbury a month ago, 18-1, enduring a thirteen-run second inning along the way. The Clippers obviously needed to stay away from the big inning against Amesbury. And they did, until the bottom of the fifth inning. 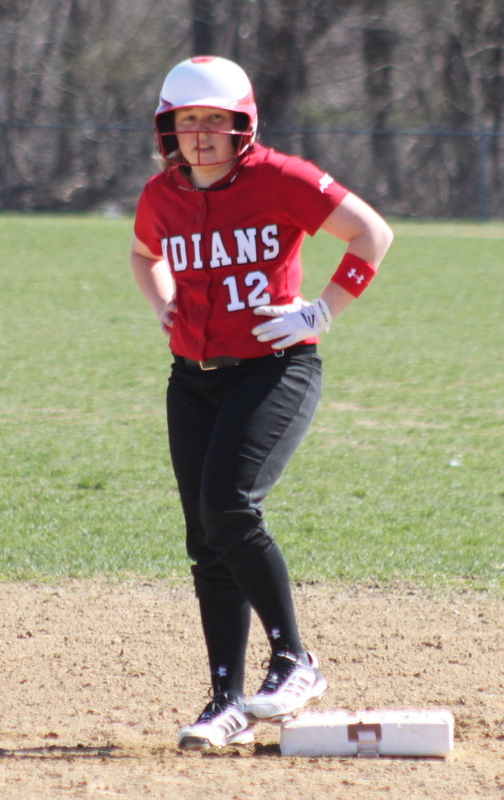 The Indians lead was only 2-1 and NHS starter Vicki Allman had retired eleven straight Amesbury hitters. 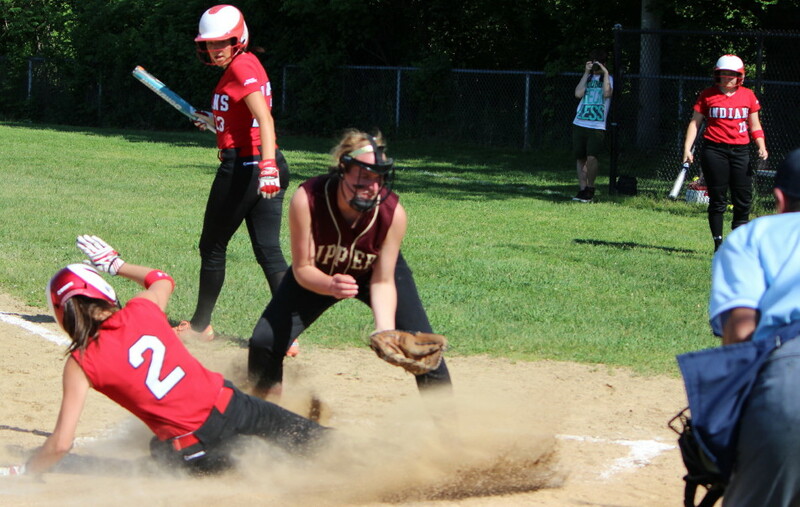 The fifth, however, started ominously for Newburyport as errors by 3B Meghan Stanton and pitcher Vicki Allman gave Amesbury baserunners they shouldn’t have had. 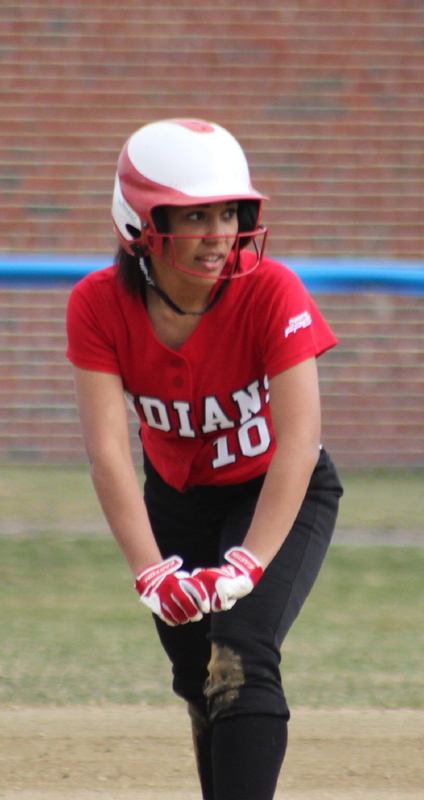 Five of the next six Indians’ batters had hits, including a double (Amanda Schell), triple (Cassie Schultz), and a homer (Ashley Valme), and the home team had seven runs and the dreaded big inning Newburyport wanted to avoid. Up 9-1, Amesbury added two more in the sixth. Amanda Schell tripled in Jenna Bartley and later scored on a wild pitch to close the scoring. 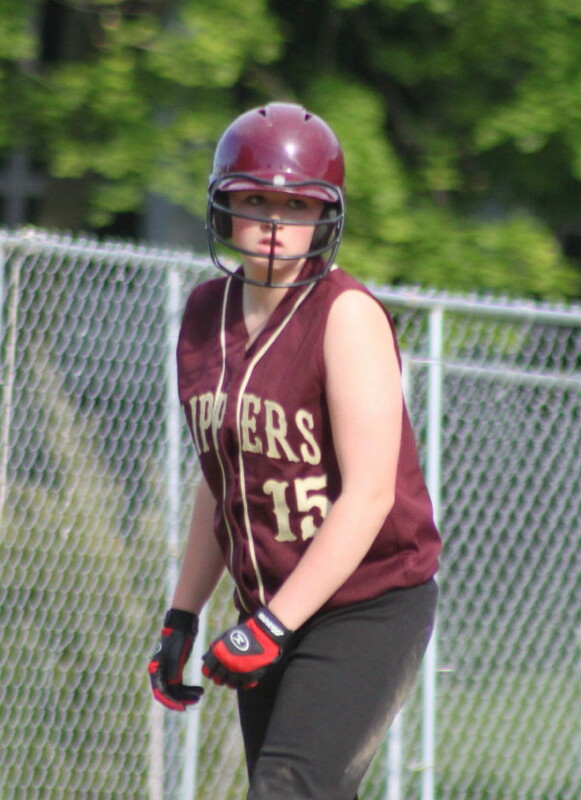 The Clippers had only four hits (Kendra Dow, Lea Tomasz, Casey Barlow, and Meghan Stanton). Carley Siemasko drove in their lone run with a sacrifice fly in the first inning. Newburyport had the bases loaded with one out in the second inning but Carolina Merrill got a force out and a fly out to end the threat. Amesbury answered with two runs in the bottom of the first thanks to their first three batters. Cassie Schultz’s double brought in Amanda Schell and Erin Leary. Weird ending to that Amesbury first. Pitcher Vicki Allman thought she had struck out Autumn Kligerman so she headed off the field and everyone followed including baserunner Lucy Scholz who was on second base. The problem was that it was only two strikes and everyone stopped exiting including baserunner Lucy. Rightfielder Casey Barlow had reached second base during the exiting part and was there to take the throw from catcher Lauren Singer and tag Lucy out for the third out as she scrambled to get back. That’s 2-to-9 for those scoring at home! 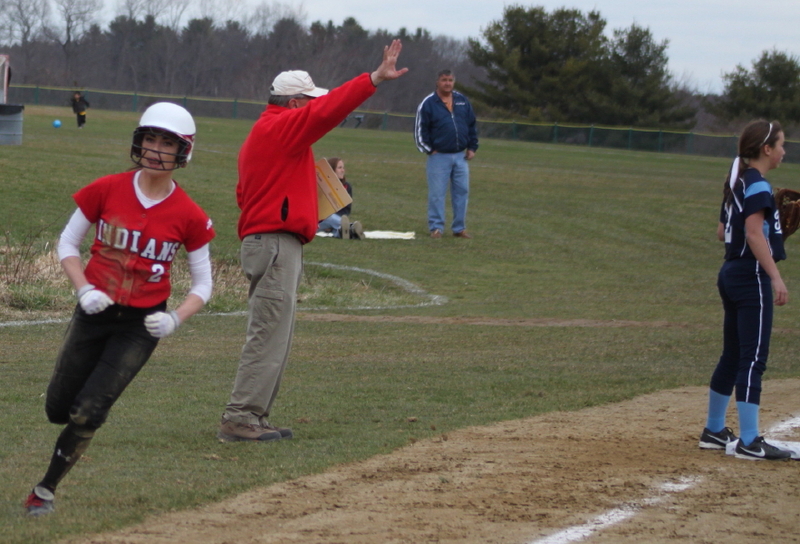 Jenna Bartley had two hits, scored two runs, and drove in a run for Amesbury. 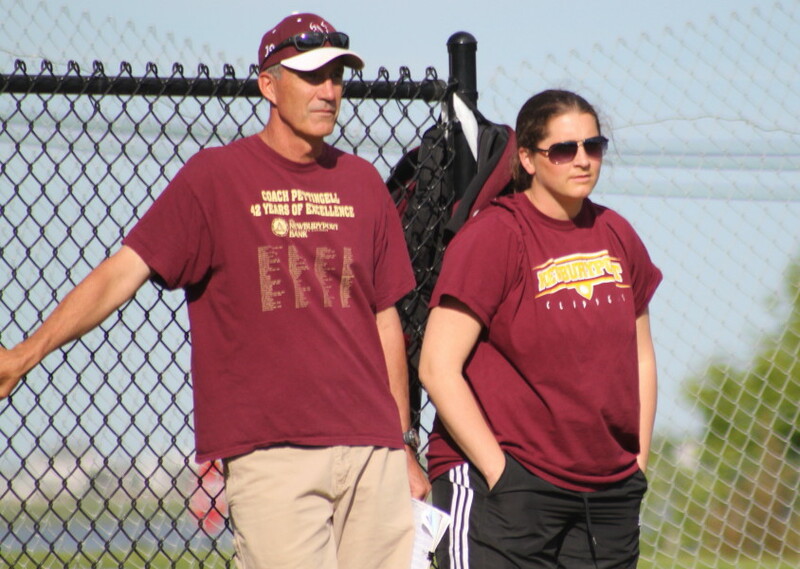 The coaches-of-the-year for the CAL were on hand for this one – AHS Chris Perry and NHS Lori Solazzo. Amesbury had a 10-game winning streak stopped by Division 1 Methuen in their last regular season game. Newbury finished 15-7 winning four of their last six. 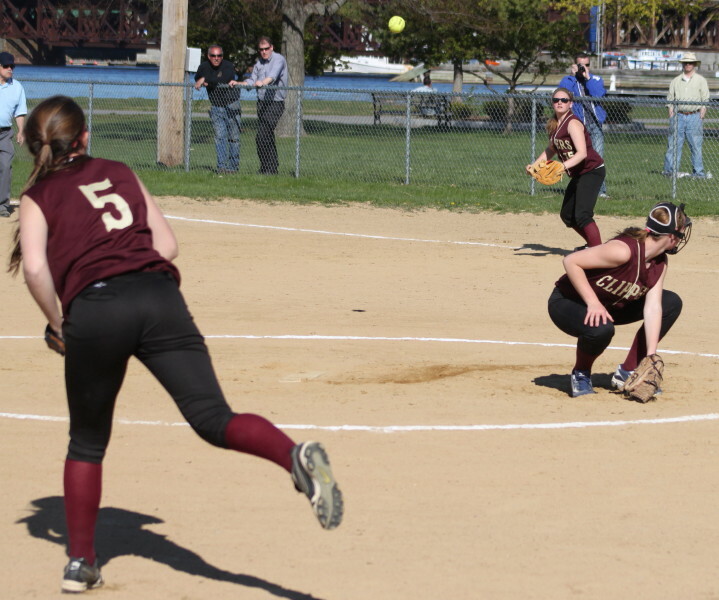 Their best game of the season may have been the 4-3 victory on Thursday over Marblehead with a nice combination of pitching, fielding, and hitting. The Clippers will have to replace senior starters Jackie Krusemark, Lea Tomasz, Kendra Dow, and Casey Barlow. Lea and Kendra have been starters for three (?) years. 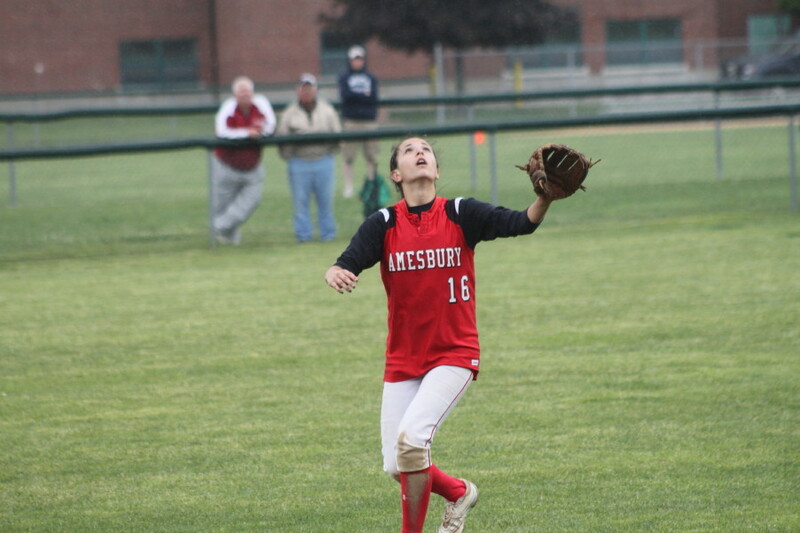 Third baseman Autumn Kligerman made two key defensive plays for Amesbury. 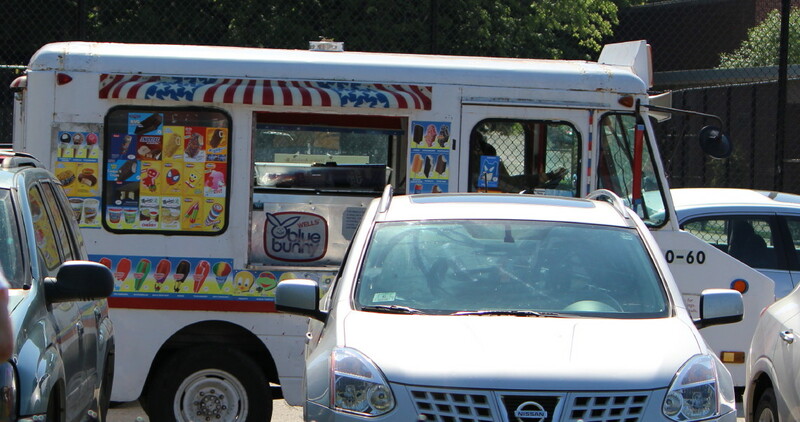 The ice cream truck had the good business sense to drive into the parking lot adjacent to the field giving off its usual sound effects. I was shocked that a good part of the sizable crowd didn’t temporarily exit to find something cool. This was Amesbury’s fifth straight win over Newburyport. Casey Barlow loses a battle to a tough sun. Now that you know the score it will take very little imagination to place “Amesbury” and “Newburyport” in the rhyme. 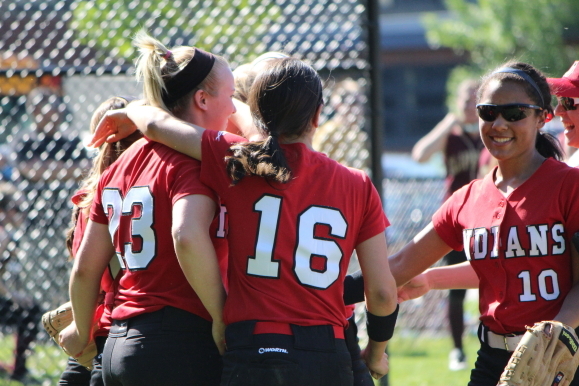 The two teams played a week ago and Amesbury won, 4-1. Who saw an 18-0, mercy-rule game coming? I will admit to being stunned by the way this game went! 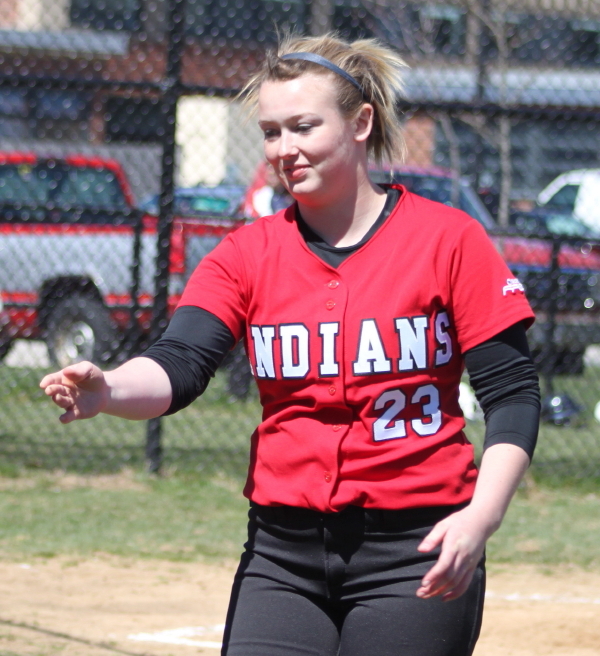 The Indians (9-1) had only six hits two days ago in a loss to Triton against Mara Spears. 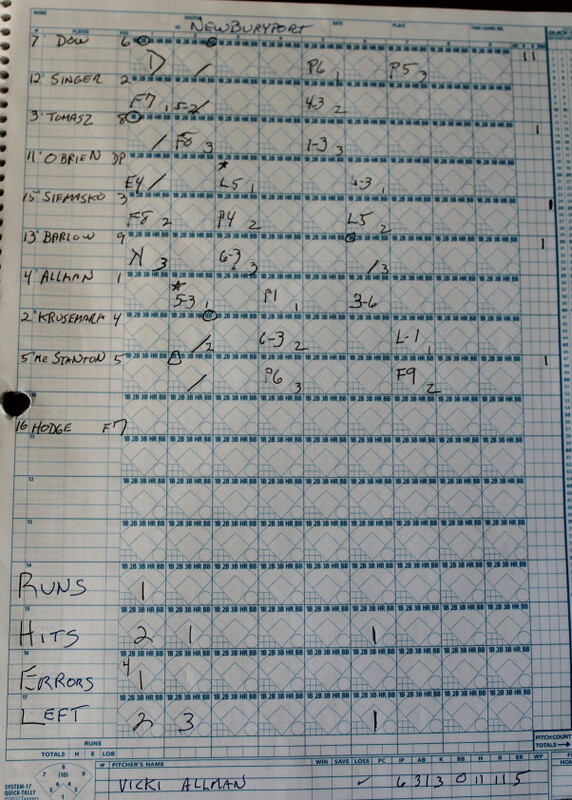 But today they battered the Clippers Vicki Allman for eighteen hits………and most of them were hard hit. 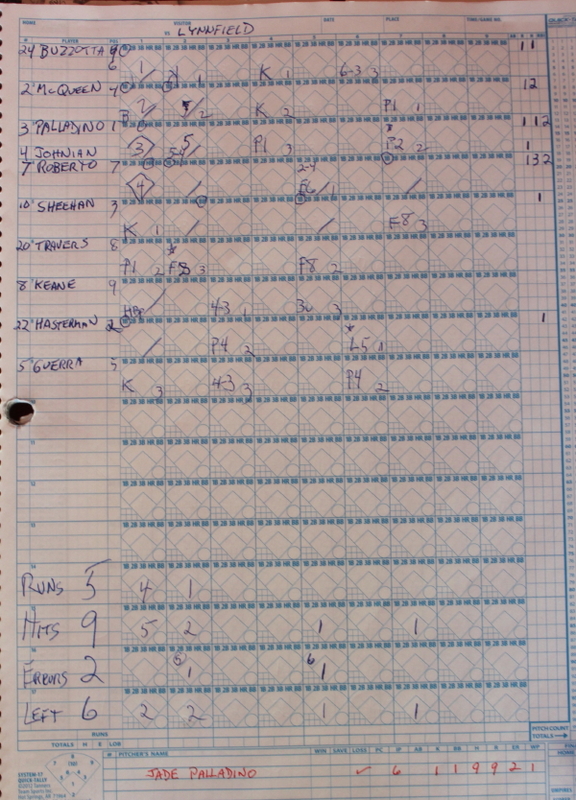 The big story out of this game was Amesbury’s second inning. The Indians sent eighteen batters to the plate and collected twelve hits and scored thirteen times. 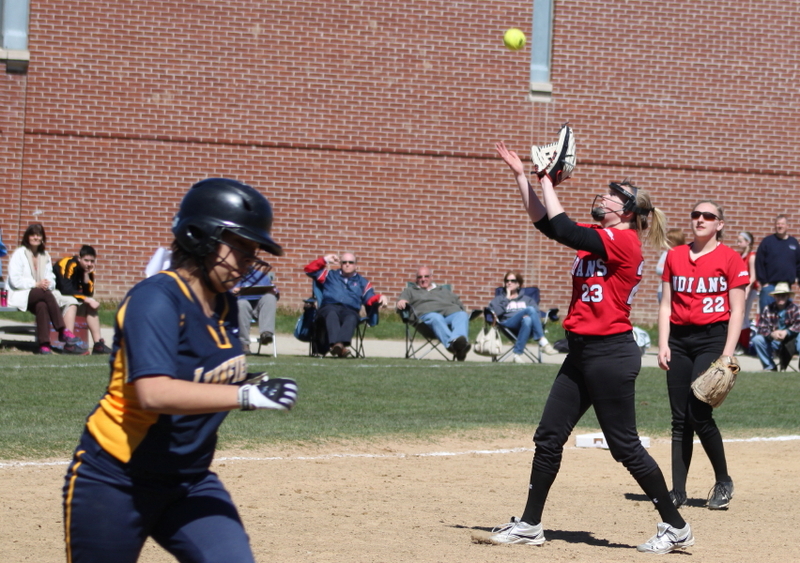 Amesbury had two triples (Amanda Schell), a double (Alexi Boswell), and singles galore. 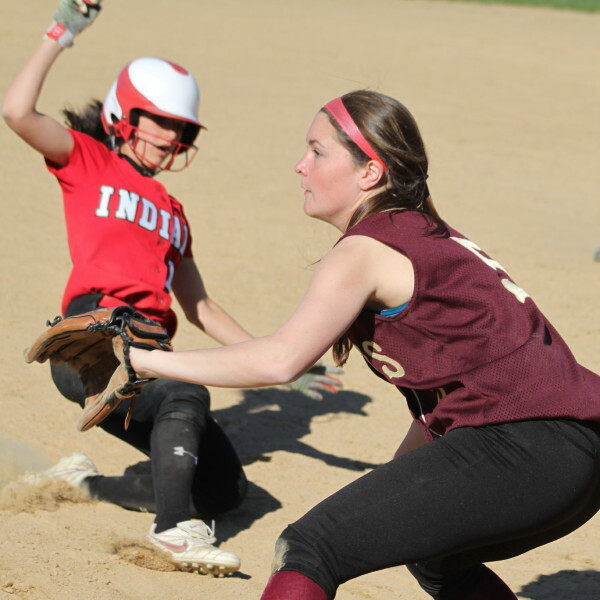 The normally sure-handed Clippers shortstop Kendra Dow had three miscues in the Newburyport nightmare. It actually took two terrific outfield plays (Ashley Casellini and Lea Tomasz) to keep the visitors from getting more runs. 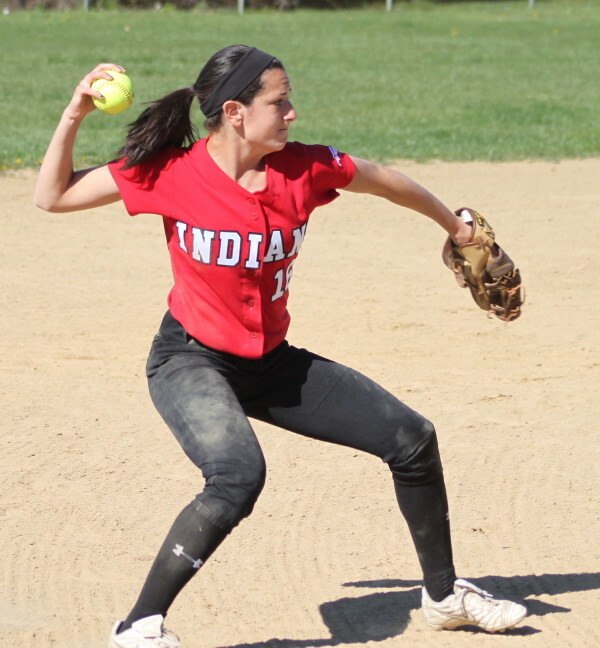 The Indians had gotten a run in the first inning as Cassie Schultz’s double brought in Amanda Schell. 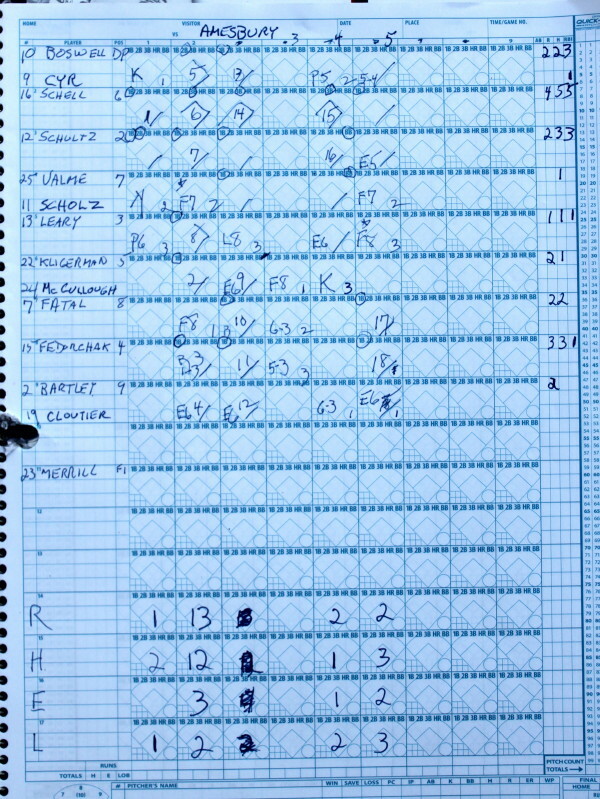 So the Clippers found themselves down, 14-0, after 1 ½ innings. 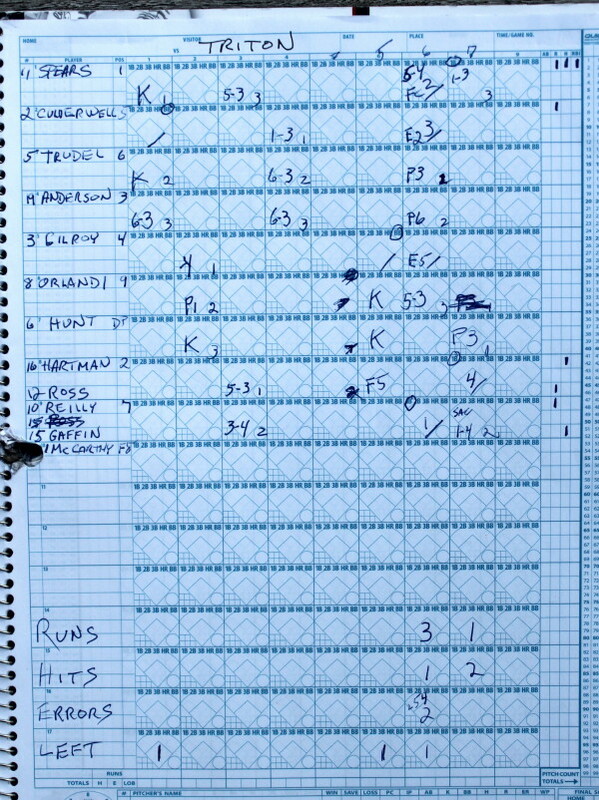 The big question then was, “How does the Mercy Rule work in the Cape Ann League?” The answer was that it’s twelve runs after five innings played. So Newburyport obviously had its work cut out for it to extend the game beyond five innings. It didn’t happen on this afternoon. As I suggested in the opening paragraph, Amesbury had everything going well including pitching, fielding (no errors), and hitting. Starter Carolina Merrill gave up four hits in four innings. 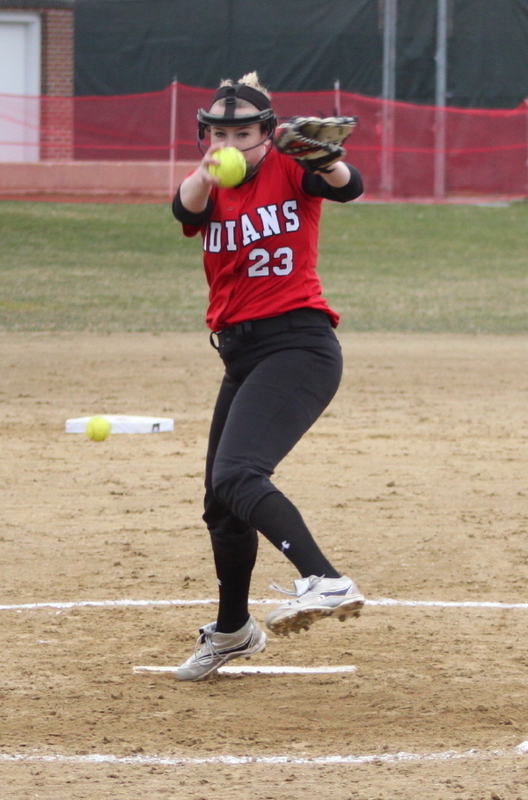 The Clippers (5-4) had two on (Kendra Dow and Lea Tomasz) with one out in the first inning but the AHS senior struck out Carley Siemasko and Jackie Krusemark to end the threat. 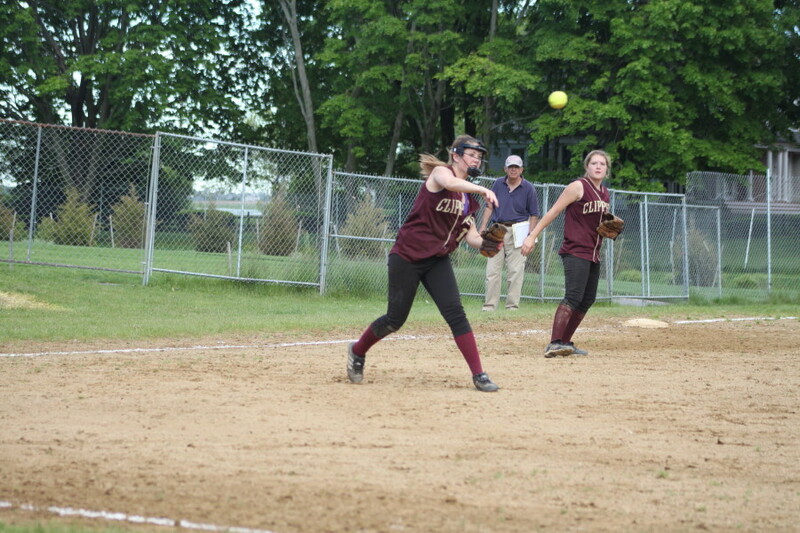 Rachel Cyr pitched the fifth getting two strikeouts. 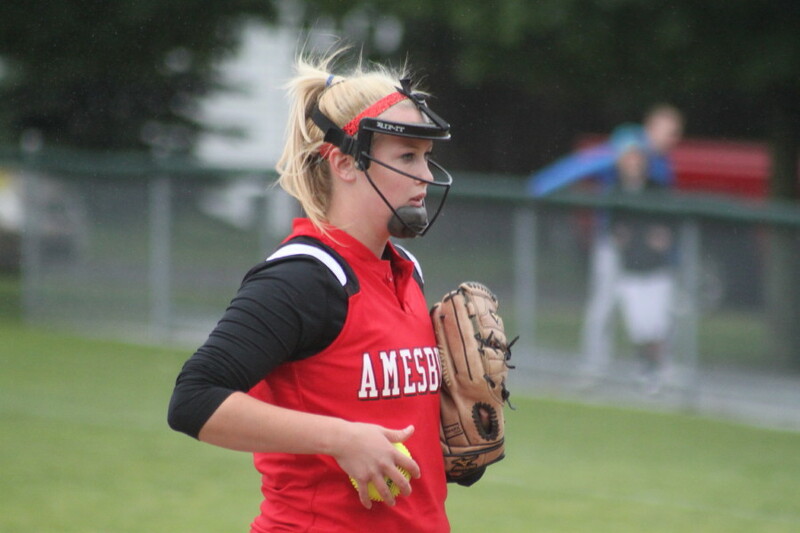 Junior Amanda Schell had a Cape Ann League Division 2 Player-of-the-Year game for Amesbury. The AHS shortstop handled six chances in the field without error. She was more impressive at the plate going five-for-five and driving in five runs. She also scored four runs. Remarkable performance! Cassie Schultz reached base all five times she batted getting three hits and adding three RBI. Freshman Lauren Fedorchak also had three hits. The second baseman scored three times. Alexi Boswell registered three RBI on two hits. The junior crossed home twice. 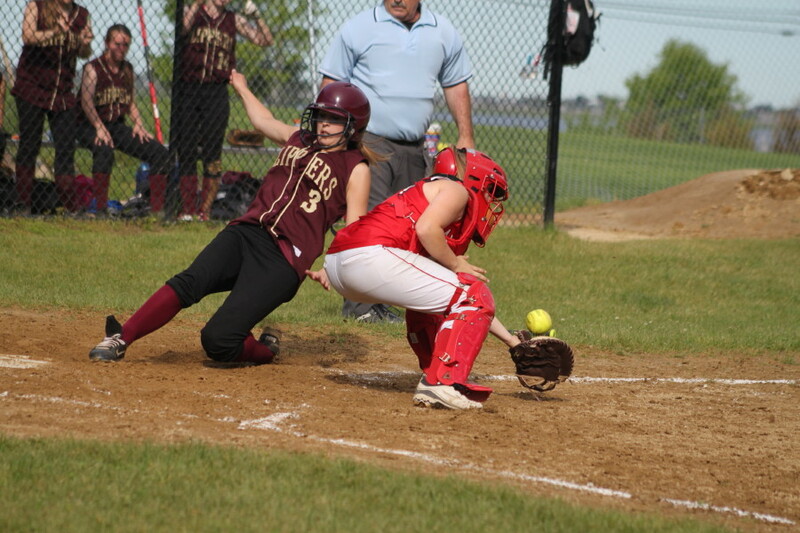 Kendra Dow had two of Newburyport’s four hits. Newburyport has now lost four straight games to Amesbury. Both teams return to action on Friday. The Clippers visit Lynnfield. Amesbury, the top team in the CAL D2, will host North Reading, the top team in the CAL D1. That matchup should be a good one. This game was originally scheduled for 7PM under the Cashman Park lights. 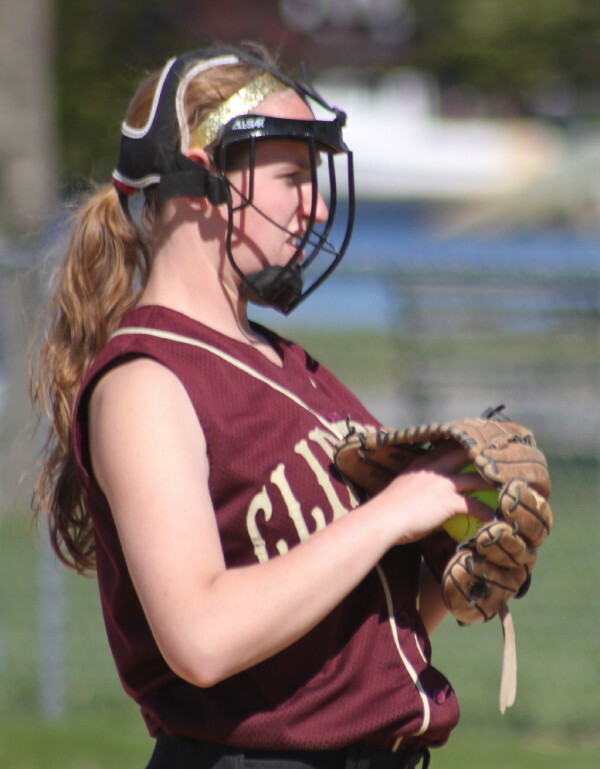 (Amesbury) Amesbury fell from the undefeated ranks as surprising Triton upset them, 4-3, on a lovely Monday afternoon of Cape Ann League softball. 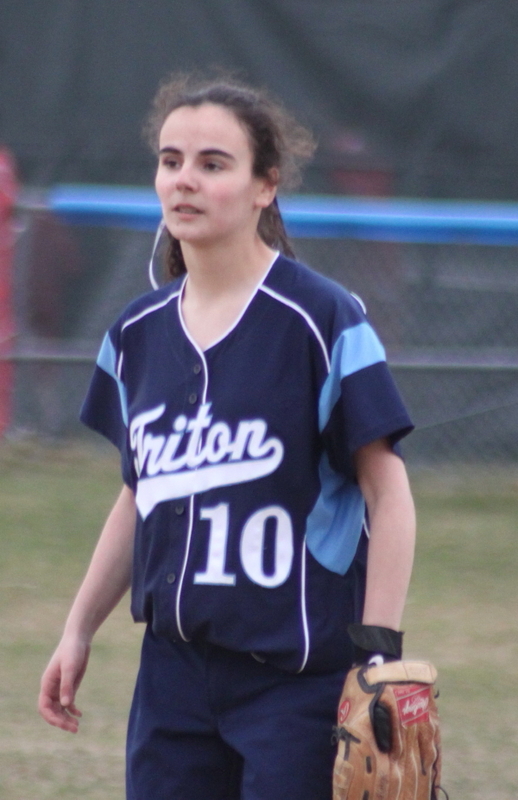 Triton (4-4) has now won four of their last five games and have certainly come a long way since their, 12-2, nonleague loss to Amesbury in the opener on April 10th. The Indians (8-1) were coasting through five innings thanks to pitcher Carolina Merrill. 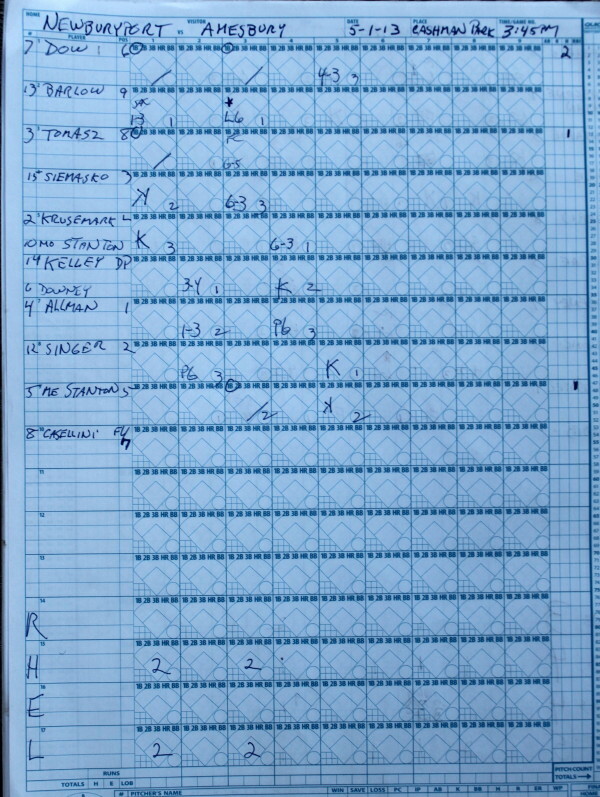 Triton was hitless and she had allowed only two baserunners on walks. Amesbury had built up a 3-0 lead and looked completely in charge. But visions of a no-hitter ended in the sixth inning. Pinch hitter Rose Gaffin hit a leadoff single to left and Alexa Reilly ran for her. That was the end of the no-hitter. Amesbury’s three-run lead also disappeared before that sixth inning was over. Three errors (Lauren Fedorchak, Cassie Schultz, Autumn Kligerman) opened the door for the three Vikings runs that tied the score. On the first error (drop of a throw) it took an overrule by the home-plate umpire or there would have been a forceout at second base. The second error was a throw after picking up a bunt try that went past first into right field. 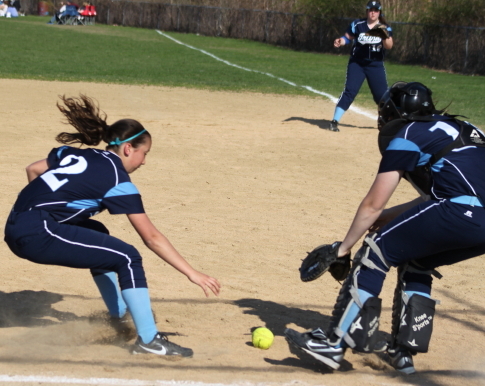 Alexa Reilly beat the throw home…..somehow, for Triton’s first run. 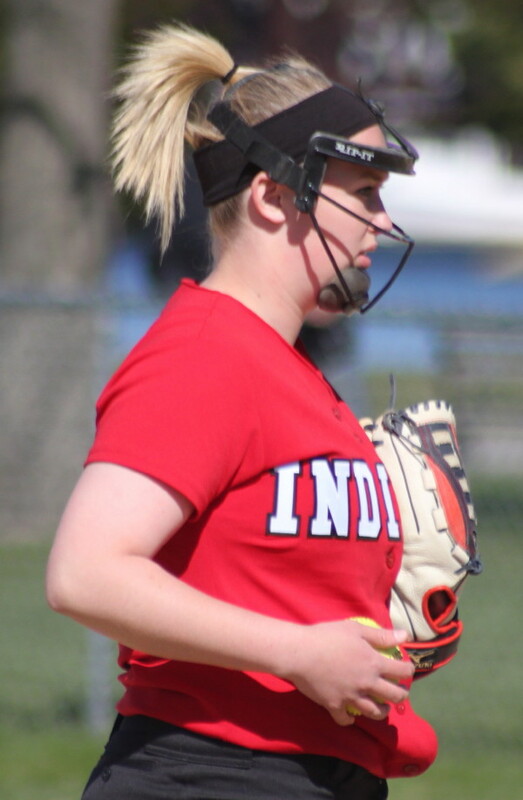 The Indians looked to be out of the inning with a 3-1 lead in place but a two-base throwing error enabled both Mara Spears and Rylee Culverwell to cross with the runs that tied the score. Now tied going into the seventh, the Vikings pushed across what turned out to be the winning run. Julia Hartman singled to left with one out. Casey Ross ran for Julia. Alexa Reilly sacrifice bunted Casey to second with two outs. Mara Spears singled into right field and Casey Ross was able to score before Mara was thrown out trying for second. 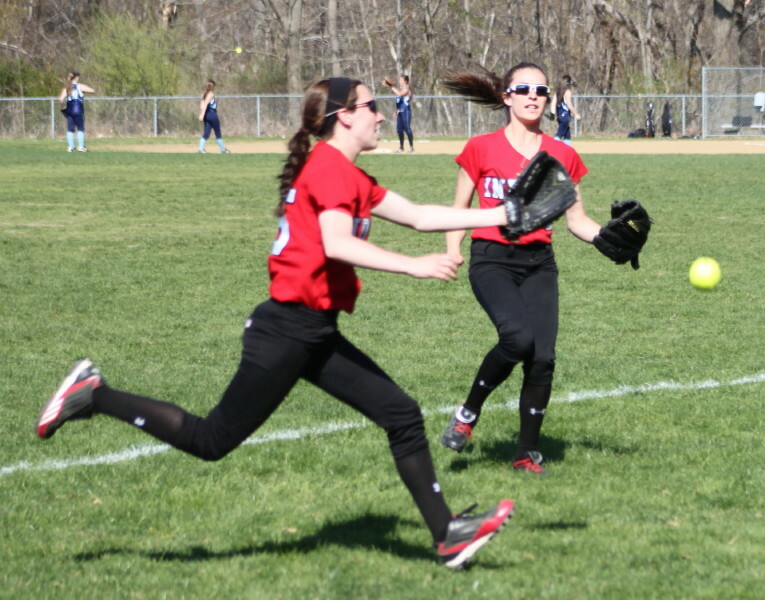 On that run-scoring play, Mara’s single reached rightfielder Jenna Bartley in a hurry. Her quick throw in was cut off by pitcher Carolina Merrill who appeared to have a good shot at the baserunner trying to score. But the throw instead went to second (getting Mara) as the run scored. 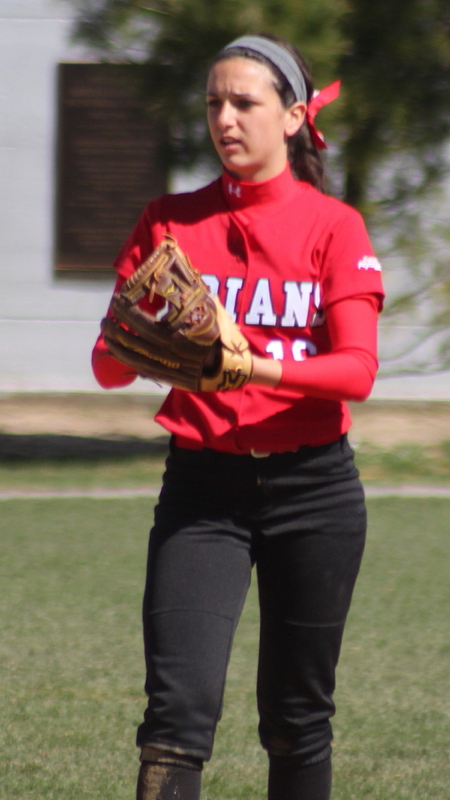 Pitcher Mara Spears retired the Indians in order in the bottom of the seventh to notch the win. Mara, in fact, retired the last seven Amesbury batters in order. Amesbury scored their first run in the second inning. Alexi Boswell (two hits/two runs) tripled to left with one out. Amanda Schell drove Alexi home with a single to right. 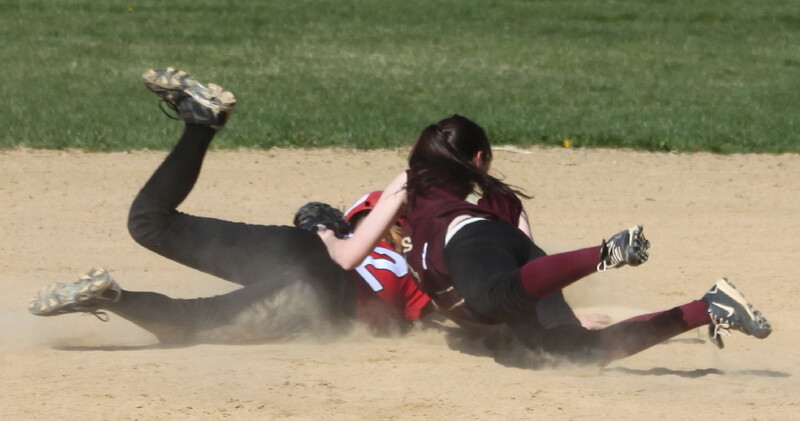 The Vikings escaped further damage that inning when Erin Leary lined to short (Kelsey Trudel) and Cassie Schultz was picked off second after the catch. The Indians would add two more runs in the fifth inning. Alexi Boswell singled down the thirdbase line then reached third after a steal and a sacrifice bunt. Erin Leary blooped a single over the pitcher to score Alexi with two outs. 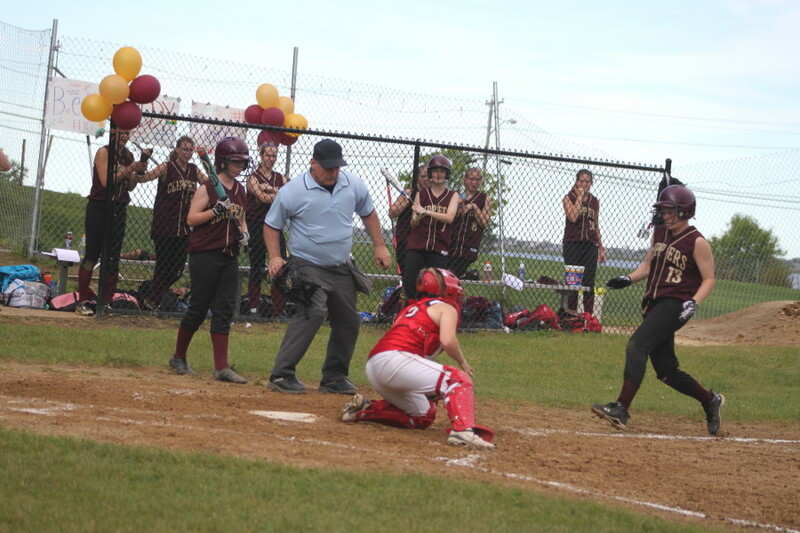 Erin would then score Amesbury’s third run when Ashley Valme’s high fly to right center was dropped when Vikings rightfielder Cara Orlandi collided with centerfielder Rachel McCarthy. Next play, however, Rachel made a nice running catch in left center to get the Vikings out of the inning. 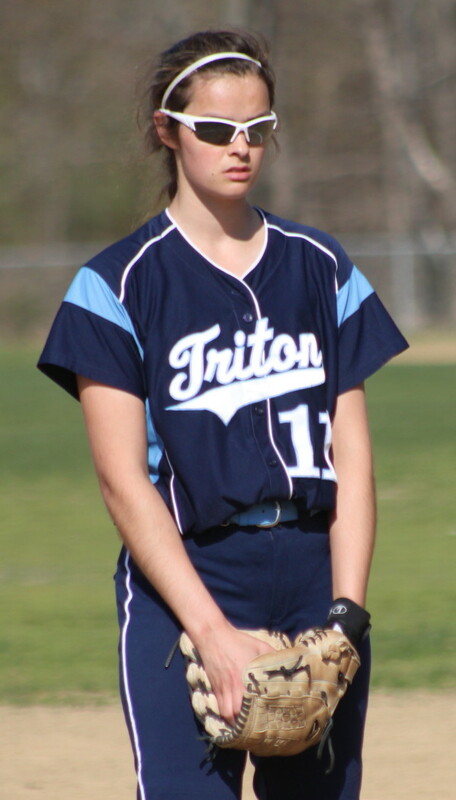 Mara Spears has been a key to Triton’s turnaround. In the 12-2 loss in the opener she allowed thirteen hits. This time around there were only six hits and none in the last 2 1/3 innings with the game on the line. There was a scary moment for Mara and the rest of us on hand. 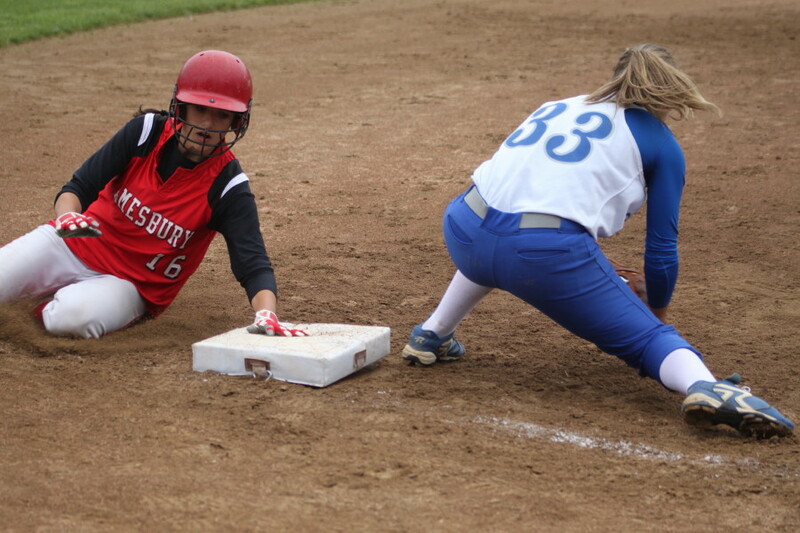 In the bottom of the fifth, after Amesbury had scored a couple of runs, Mara threw a pitch and crumpled to the ground. It looked serious and having seen Cori Simons down and out five days ago you feared the worst. However, Mara got up, got some medical counsel, and resumed not allowing a base runner the rest of the way. Carolina Merrill deserved a better fate. The talented senior surrendered only three hits and one earned run. 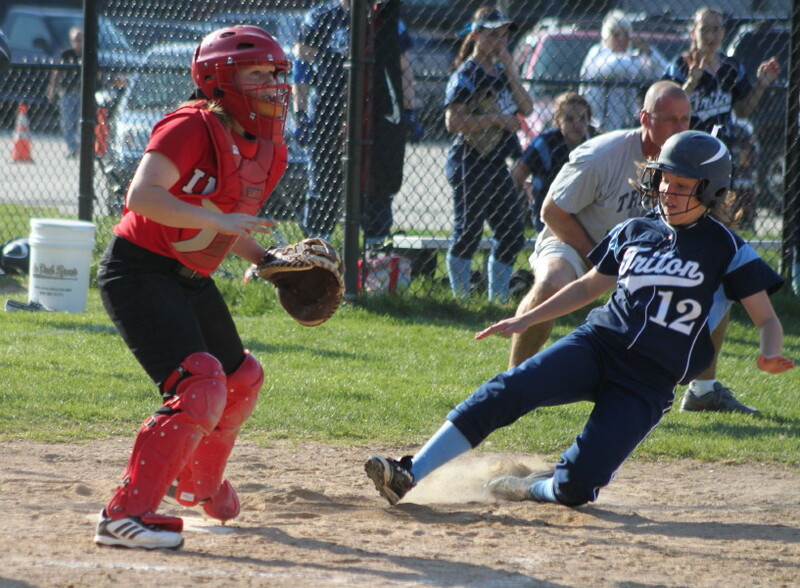 Her normally defensively reliable teammates let her down in Triton’s 3-run sixth. 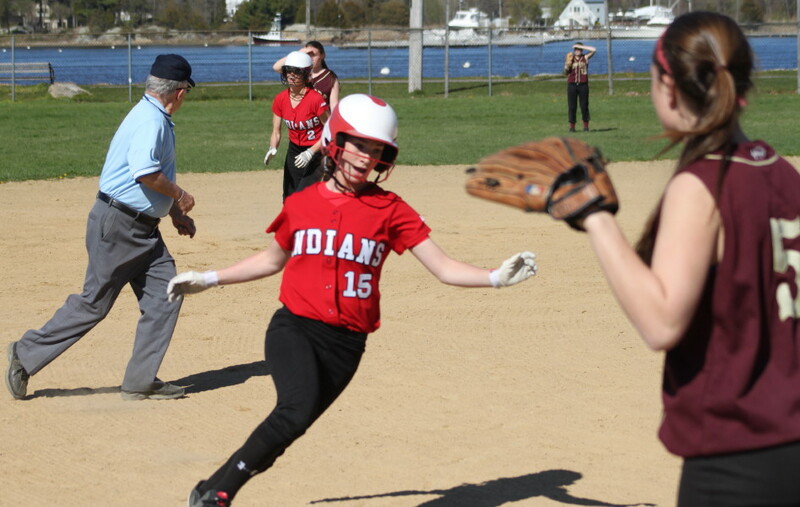 Ashley Valme and Alexi Boswell each had two hits for Amesbury. Besides pitching the six-hitter, Mara Spears had a hit, scored a run, and had an RBI. Cara Orlandi and Peyton Hunt tried to bunt with two strikes on them in the fifth and ended up striking out. Third baseman Rylee Culverwell and catcher Julia Hartman had trouble with Autumn Kligerman’s bunt in the fourth inning. The last time Amesbury lost was June 3, 2012 to Danvers (2-0) in the Division 2 North quarterfinals at Danvers. 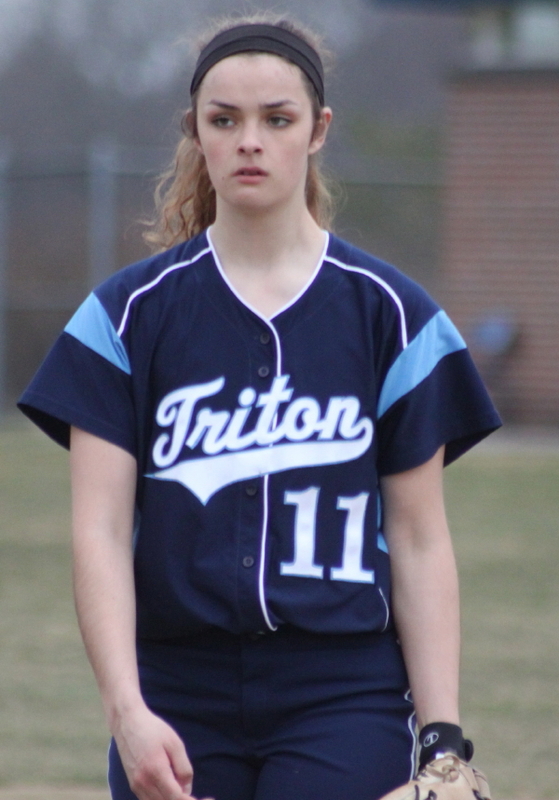 Cori Simons was a frustrated spectator for Triton. She hopes to get back playing before too long. Next for Triton is hosting Lynnfield on Wednesday. On the same day Amesbury travels to Newburyport. Fly balls gave Lynnfield trouble in the sixth inning. Malia Roberto (#7) after her homer in the first inning. 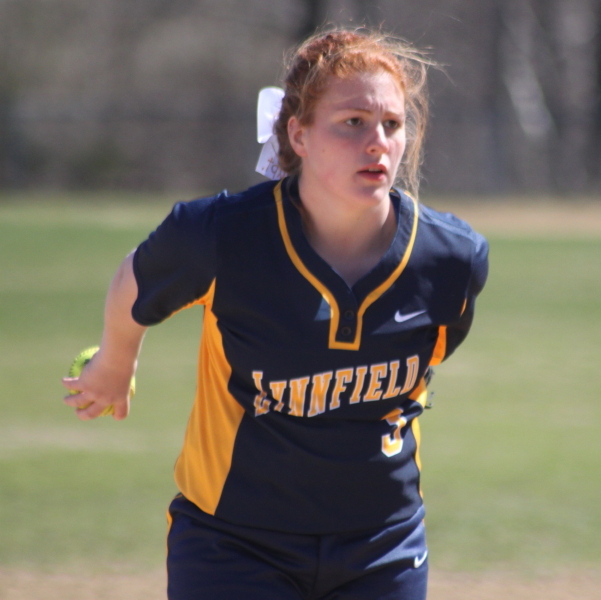 (Amesbury) Lynnfield took a four-run lead into the sixth inning before falling apart in the field and losing to undefeated Amesbury, 9-5, on a sunny Wednesday morning in Cape Ann League softball. The Pioneers (2-3) had six errors in the final two innings and therein squandered an impressive hitting display in the first two innings. Lynnfield had four runs after four batters to start the game. Two singles (Rachel Buzzotta and Mandy McQueen), a triple (Jade Palladino), and a home run (Malia Roberto) in the top of the first inning had me wondering what the Pioneers had been served for breakfast! But a strikeout by winning pitcher Carolina Merrill enabled the Indians (3-0) to end that first inning with two Pioneers stranded and only four runs given up. 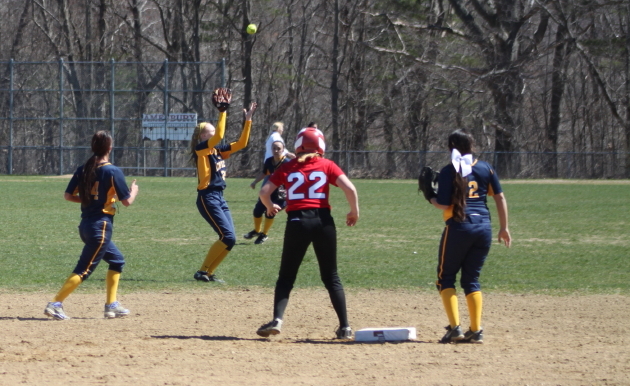 Lynnfield had a run in and two more runners on in the second inning when centerfielder Janine Fatal made a nice running catch to limit the damage to one run. Surprisingly, the Pioneers had just two hits over the final five innings but their defense held Amesbury to one run through five innings. 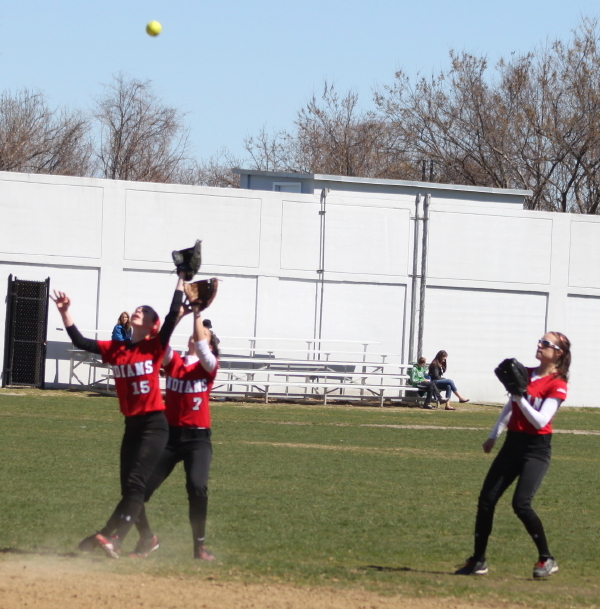 Leftfielder Malia Roberto, third baseman Lauren Guerra, and shortstop Rachel Buzzotta made terrific plays in the 4th and 5th innings. However, that 5-1 Lynnfield lead after 5 ½ innings melted like a Hodgies ice cream cone on a hot day in the bottom of the sixth inning. 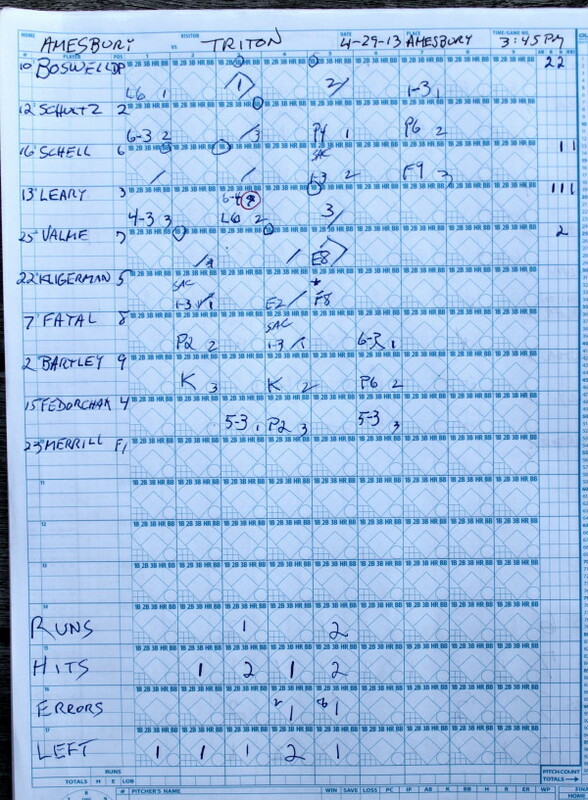 That sixth is probably an inning that has been deleted from the Lynnfield scorebook by LHS coach Peter Marinelli. And no one could blame him! When you put together a mixture of five hits, four errors, and a wild pitch, bad things will happen. Twelve Indians batters took part in that sixth inning and eight runs scored. More than enough to win this one for Amesbury. 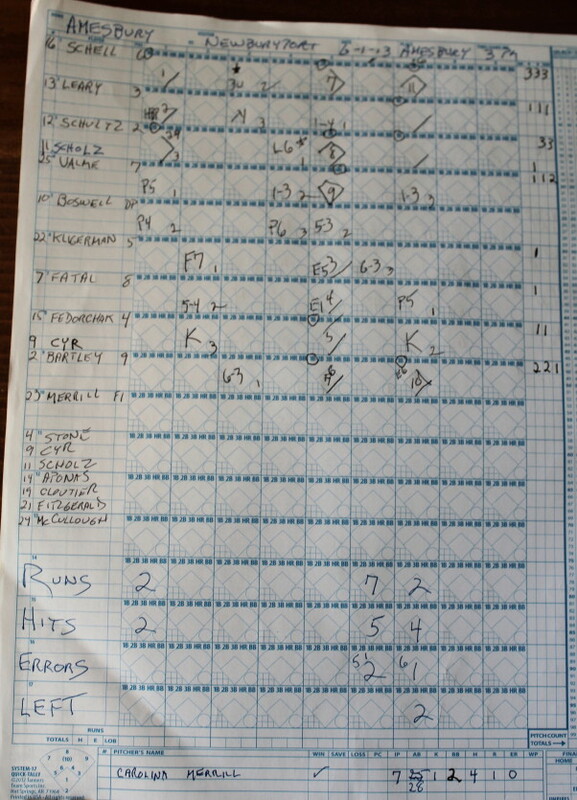 By my (unofficial count) only two of Amesbury’s nine runs were earned. 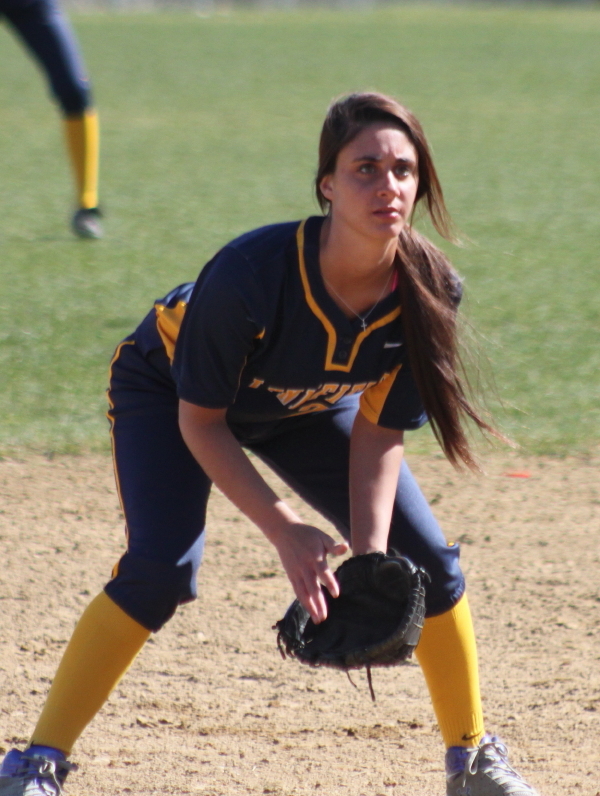 LHS starter Jade Palladino obviously deserved a better fate. Junior Malia Roberto had a 3-hit morning including a 2-run homer to right-center in the first inning. 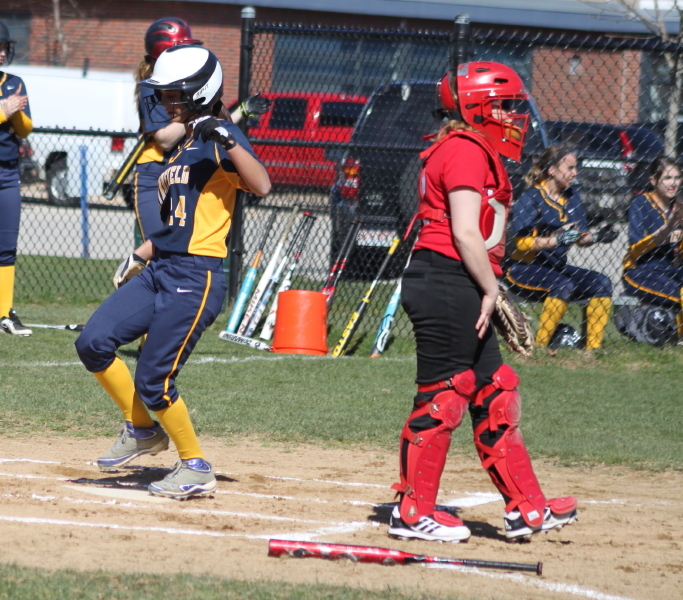 Senior Mandy McQueen had two singles and scored a run for Lynnfield. 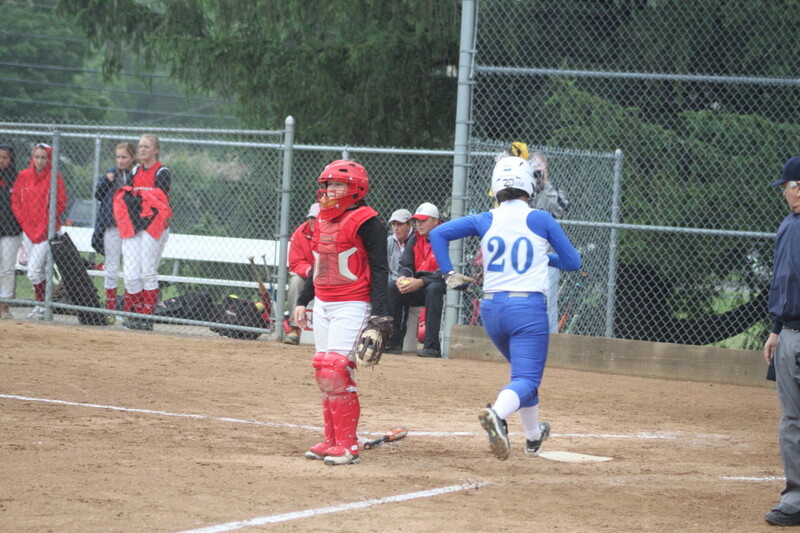 Jade Palladino tripled to straightaway center in the first inning driving in two Pioneers runs. 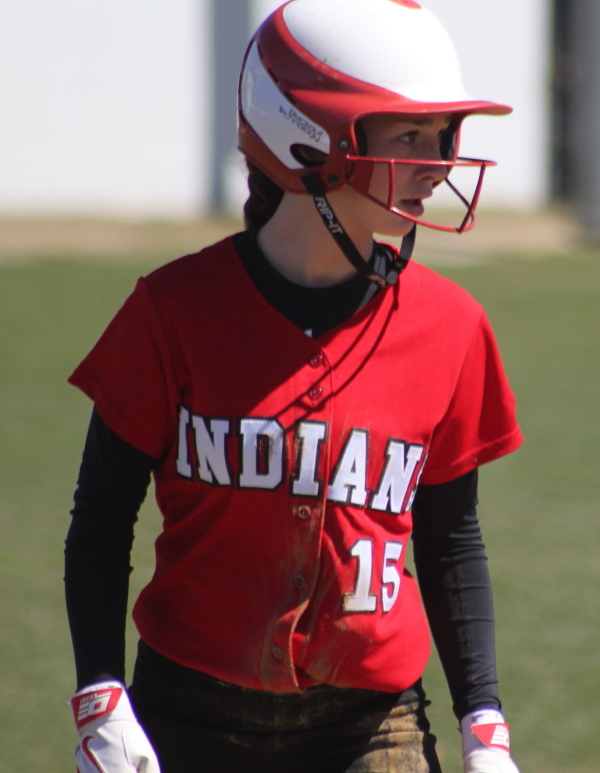 Junior Amanda Schell had two hits and scored two runs for the victorious Indians. Autumn Kligerman made a nice play on a line drive to go along with scoring a run, getting a hit, and driving in a run. 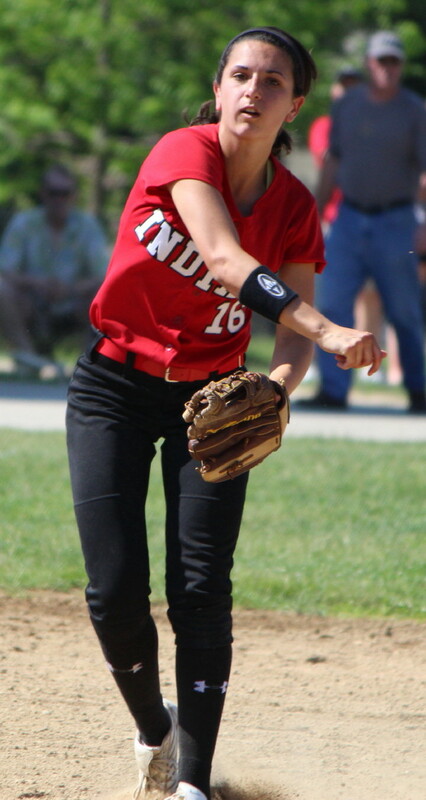 A key in the Amesbury win was the way senior Carolina Merrill took charge in the last five innings. When she started mixing in a very good changeup with her fast pitches, LHS batters lost some of their early-inning aggressiveness at the plate. I suspect that the LHS outfield defense will be getting some serious practice time in the near future. Two drops on routine fly balls were a big part of the Pioneers demise in that fateful sixth inning. Both teams return to action on Friday. Lynnfield hosts Malden (10:30AM) while Amesbury visits Pentucket (10AM). 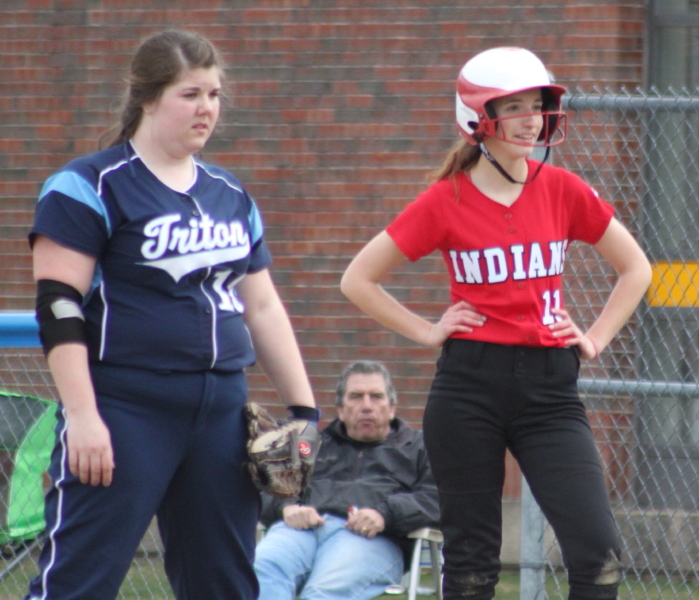 (Byfield) Triton was in trouble even before their game with Amesbury started. 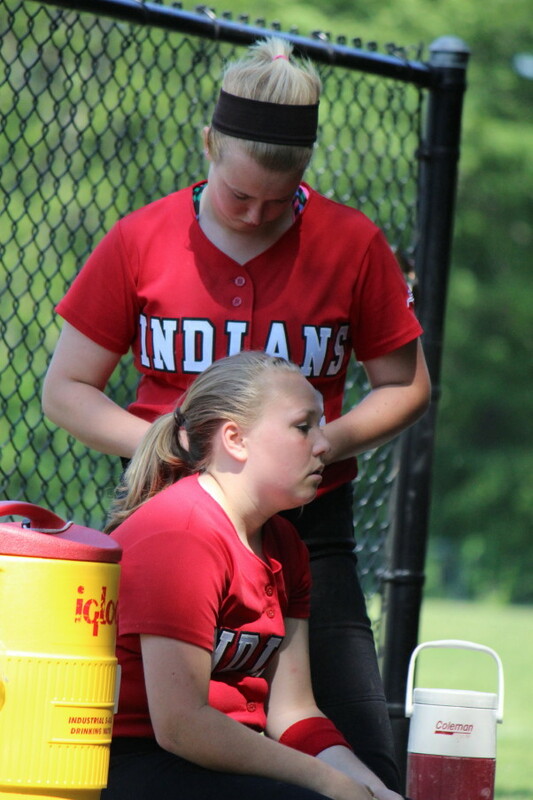 Cape Ann League All-Star Shannon Sinton was sidelined because of a preseason injury. The Vikings shortstop will be back with the team in a couple of weeks. 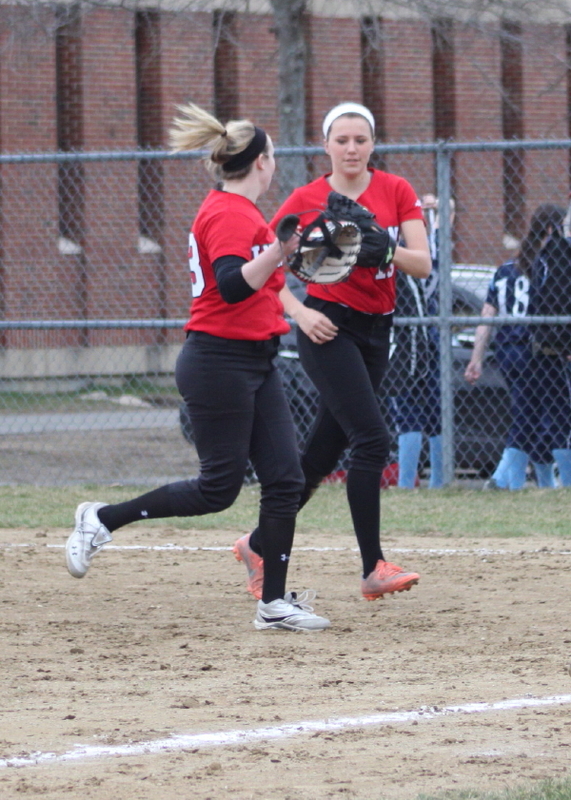 In the season opener for both softball teams Amesbury came away with a decisive, 12-2, win on a cloudy Wednesday afternoon. The Indians were 17-5 in 2012 and have plenty of that team back. They had hits and base runners in every inning. 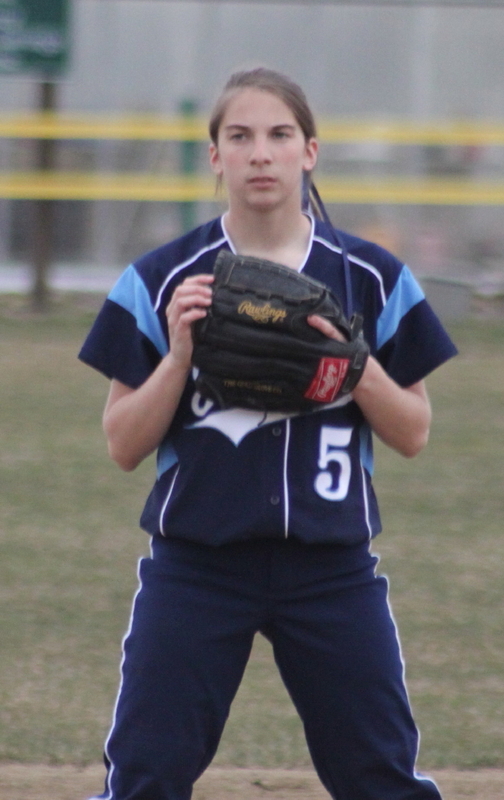 And while the Indians were hitting and running the bases and building up an 8-0 lead, their pitcher (senior Carolina Merrill) held Triton scoreless scattering two hits and striking out five. 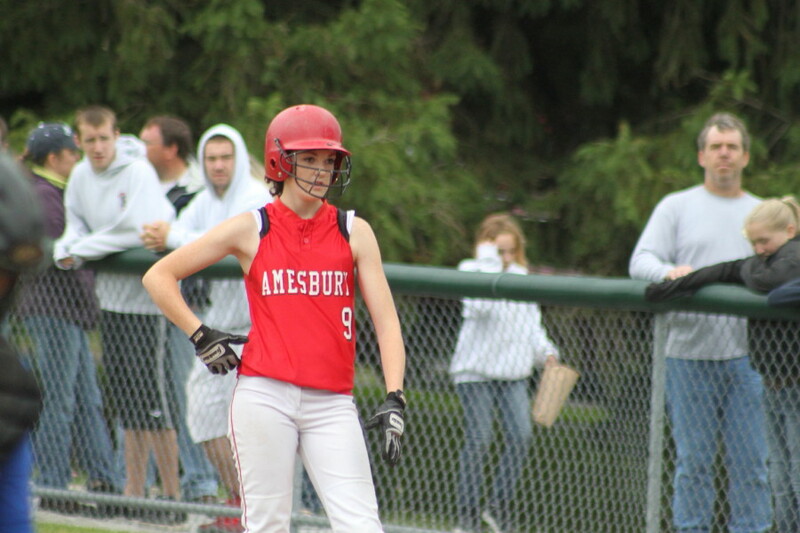 Amesbury had thirteen hits (by my count) and took the extra base time after time. 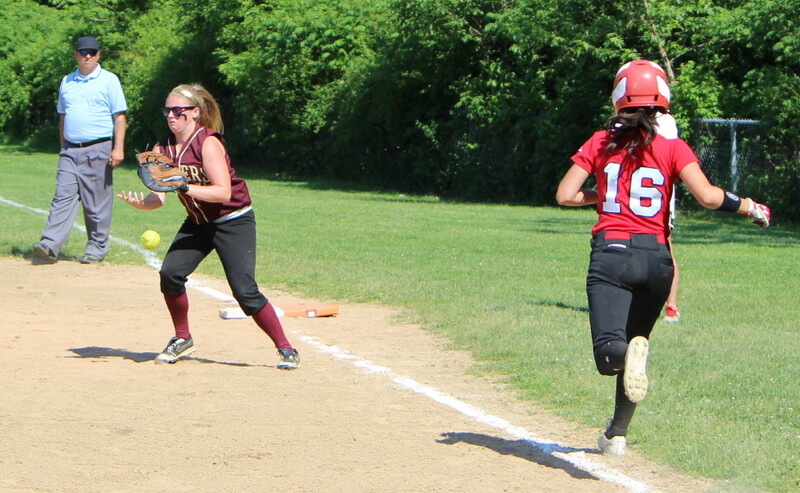 Amanda Boswell was the ideal leadoff batter for Amesbury in this one. The speedy junior reached base on all five at bats and scored four runs. Mara Spears absorbed the loss for Triton. The Viking junior walked only one but despite some pretty good speed couldn’t keep the Indians from making good contact. Cori Simons had a 2-run single for Triton in the final inning. This was a non-league game. The CAL league game between the teams is on April 29th. 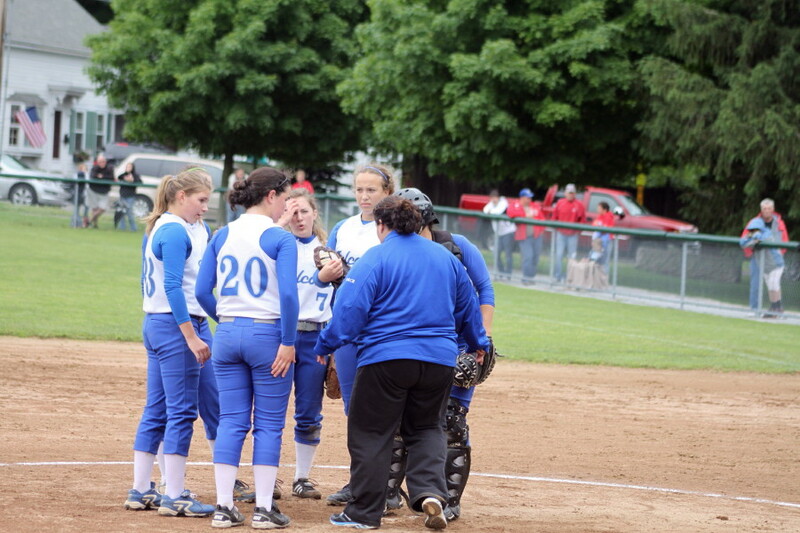 Today’s game featured three 2012 CAL All-League players – Cori Simons, Cassie Schultz, and Erin Leary. In this game, Erin had a home run down the left field line. Kelsey Trudel, Shannon Sinton, Carolina Merrill, and Amanda Schell made the CAL All-Star team in 2012. Last time I saw Amesbury play they were losing a tough 2-0 game at Danvers in the post-season tournament. Triton’s next game is hosting Pentucket on Friday. Amesbury hosts Georgetown on Thursday. 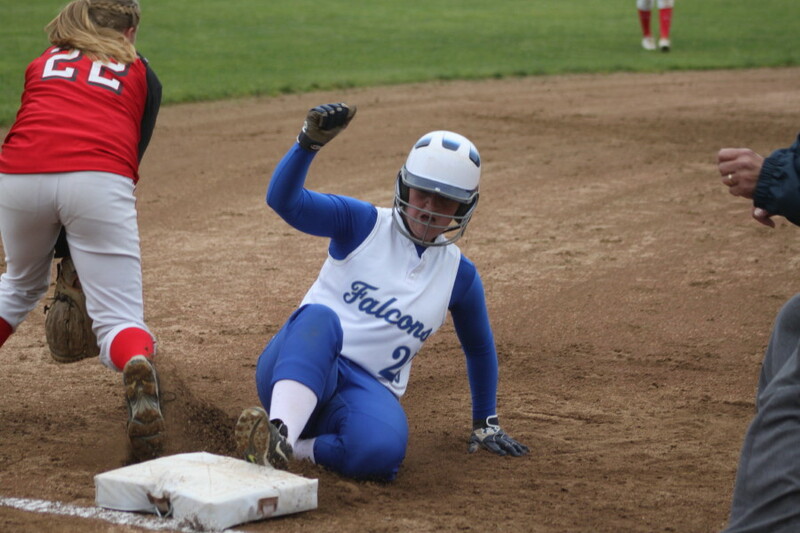 Caitlin McBride scores the first of Danvers two runs in the crucial second inning. 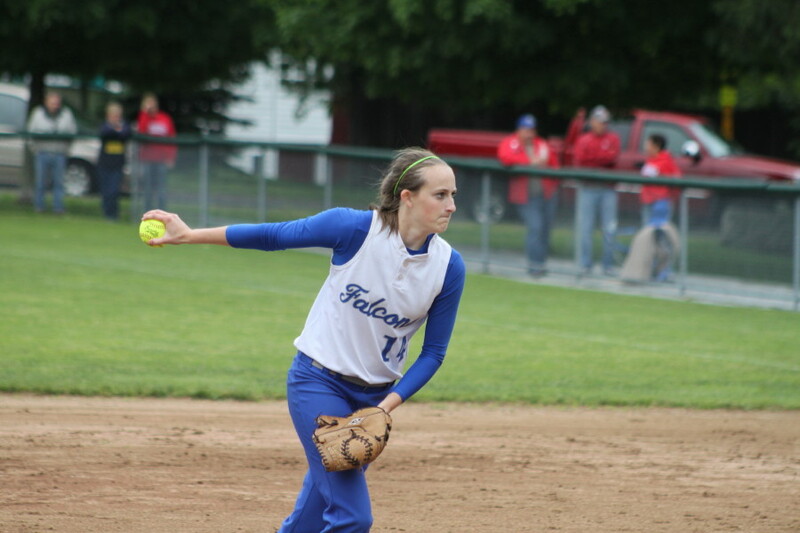 Kendall Meehan pitched a 5-hit shutout and drove in a run with a walk. (Danvers) It was one of the better two-strike at bats you’ll ever see in a high school softball game. 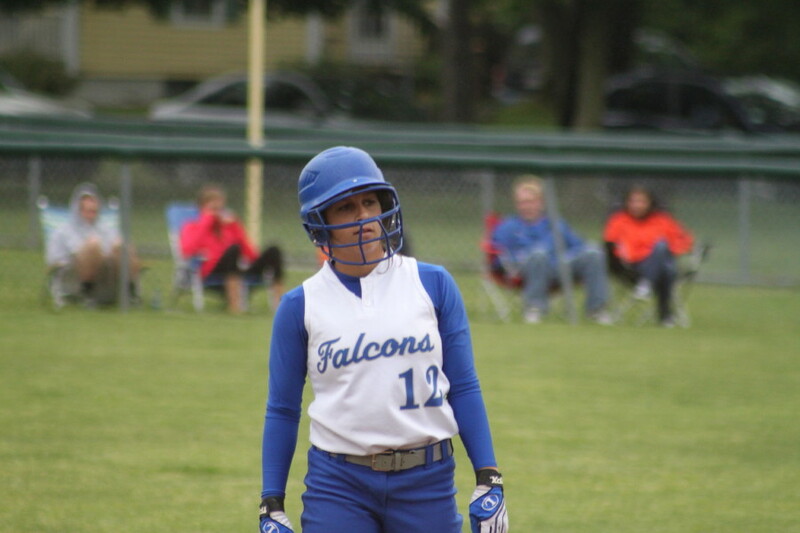 With the bases loaded, Danvers’ Kendall Meehan spoiled at least five two-strike pitches before earning a run-producing walk in the Falcons second inning. 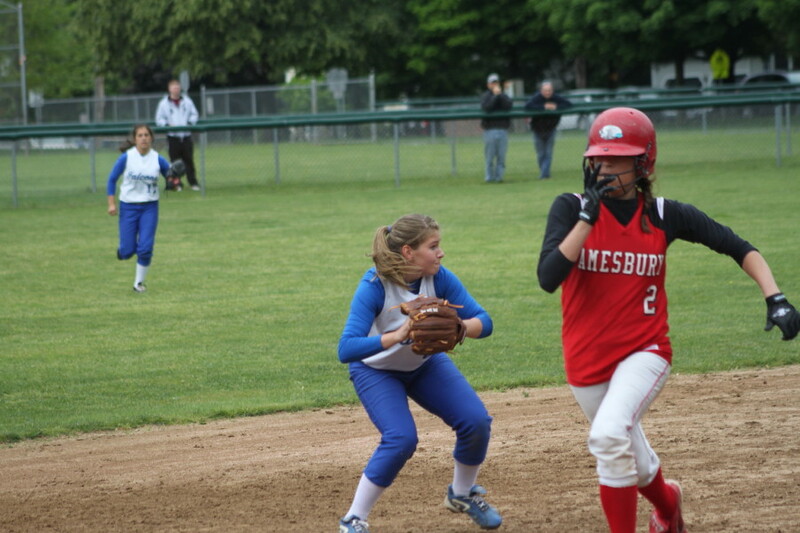 That run and another one in the same inning were enough for #4 seed Danvers (19-3) as they defeated #5 seed Amesbury, 2-0, in the Division 2 North softball quarterfinals on a misty Sunday afternoon at Great Oak School in Danvers. The Falcons next opponent will be either #1 seed Dracut or #8 seed Arlington. Those two teams are scheduled to play on Tuesday night. 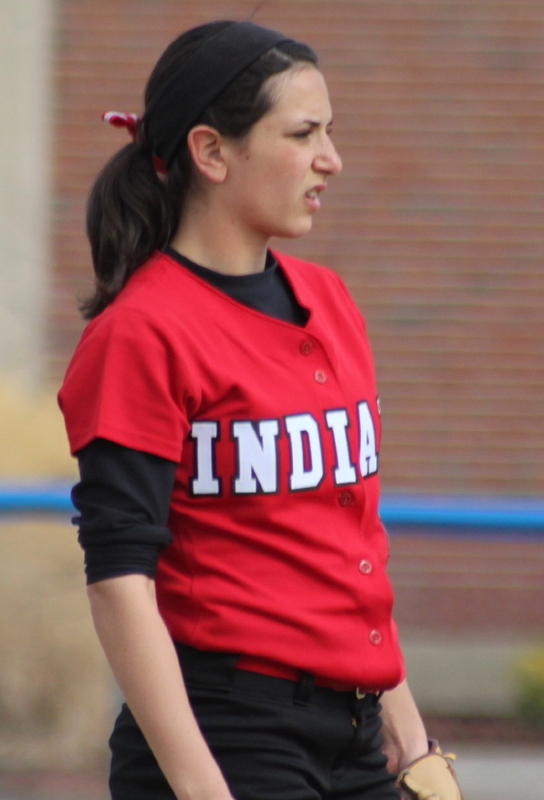 This game was quickly played (75 minutes) and there was little to choose between Amesbury starter junior Carolina Merrill (four hits and three strikeouts) and Danvers’ starter sophomore Kendall Meehan (five hits and two strikeouts) except for the game-deciding second inning. In the decisive second, freshman Caitlin McBride doubled to left center and reached third on Devyn Downs’ sacrifice fly with one out. Julia Saggese’s single to left drove in Caitlin with the first Falcon run. Amesbury has trouble with a bunt in the second. The second Danvers run of the inning was tainted. Devin Johnson had walked before Julia’s single so there were runners on first and second with one out. 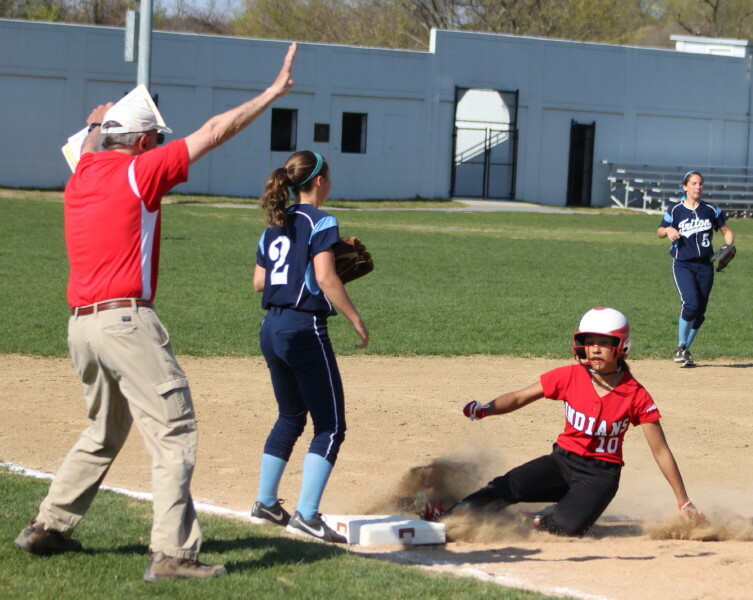 Erica Fleming’s bunt attempt was mishandled by Indian third baseman Autumn Kligerman loading the bases with two out. Kendall Meehan then delivered Devin with the second run on the crucial walk I described above. Carolina Merrill retired the next batter to end the inning but the unearned second run was on the books. 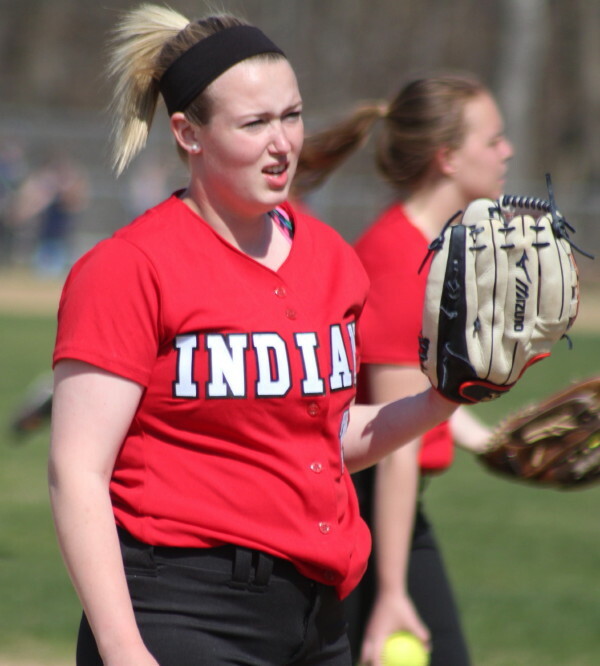 The Indians (16-6) had several promising innings but the combination of flawless Falcon defense and Kendall Meehan’s pitching preserved the shutout. Amesbury didn’t do itself any favors by having leadoff batters doubled off first in the first (Amanda Schell) and the second (Erin Leary). Amanda Schell reaches third in the fourth inning. The Indians threatened in the fourth. Amanda Schell doubled to right-center leading off but only got as far as third. In the fifth, Amesbury put two hits together (Alexis Boswell and Rachel Cyr) with two outs but Kendall K’d her mound opponent Carolina Merrill to close out the inning. 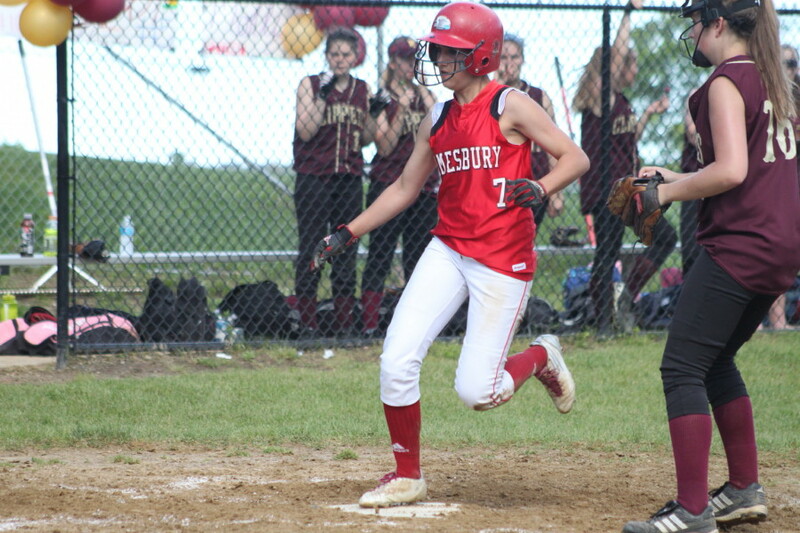 Amesbury’s Jenna Barley singled in the seventh and reached second on a sacrifice fly with two outs but a routine grounder to shortstop Brittany Dougal ended the game. 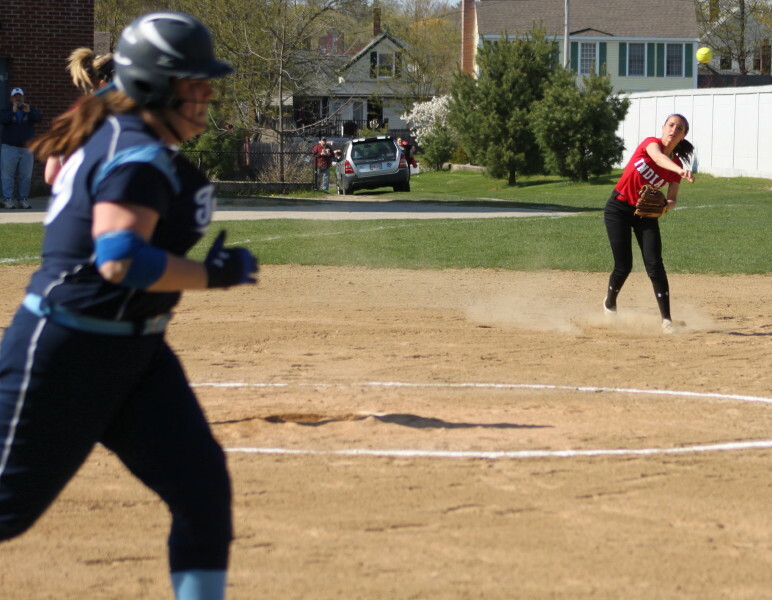 Danvers only opportunity to score other than the second inning was in the fifth when both Brittany Dougal (double) and Chrissy Gikas (Amanda Schell error) reached with one out. But Carolina Merrill pitched her way out of that one with a popup and a ground out. Shortstop Brittany Dougal prepares to record the final out of the game. 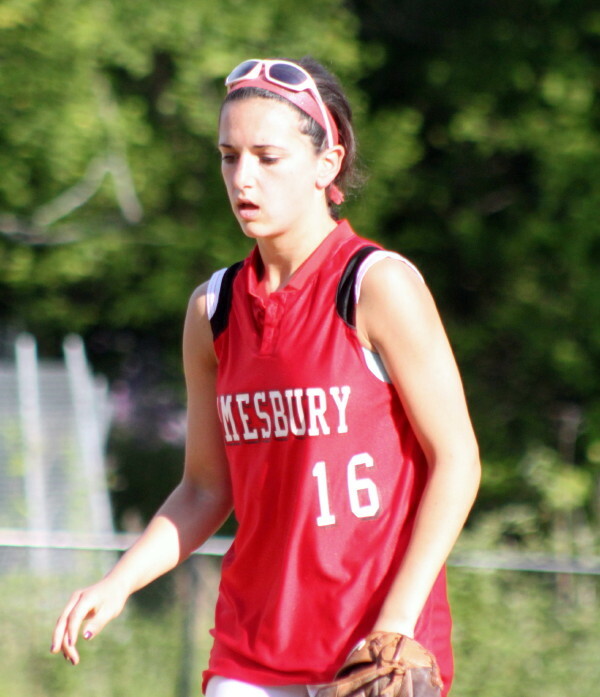 Amesbury has no seniors on the 2012 team. 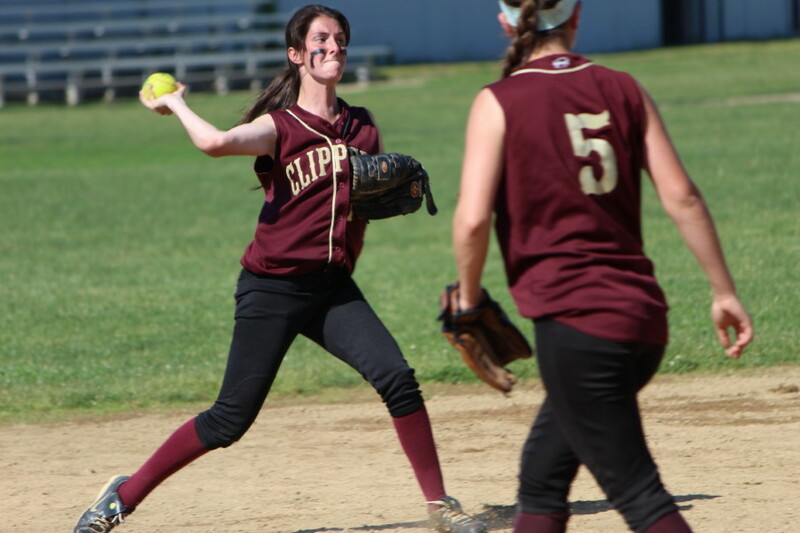 Juniors Cassie Schultz and Erin Leary made the All-League team in the Cape League this season. Teammates Amanda Schell (sophomore) and Carolina Merrill (junior) were named CAL All-Stars. 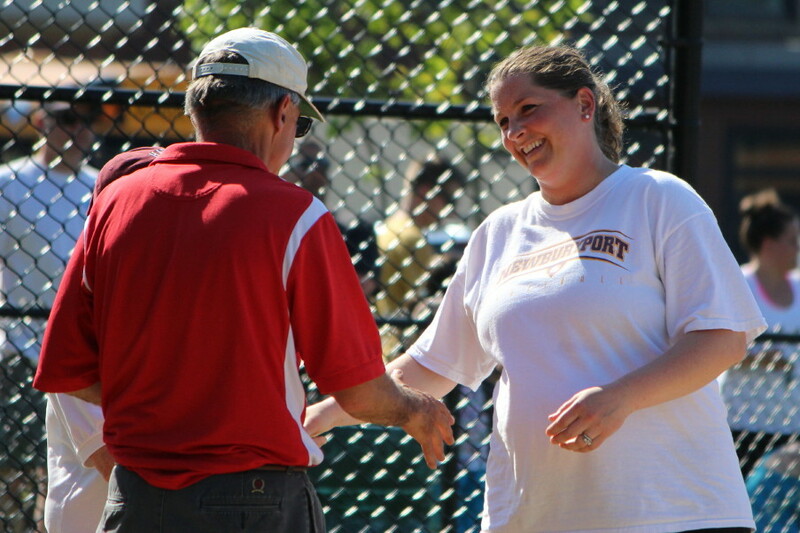 Danvers coach Tara Petrocelli (second year) was the Coach of the Year in the NEC South. Kendall Meehan is now 13-3. Kendall Meehan, Sam DiBella, and Chrissy Gikas made the 2012 Northeast Conference South All-Star team. I was told that the Great Oak School field was waterlogged Saturday but town workers made it playable today. It was in terrific shape. Caitlin McBride reaches third in the second inning. Shortstop Amanda Schell locates a popup. 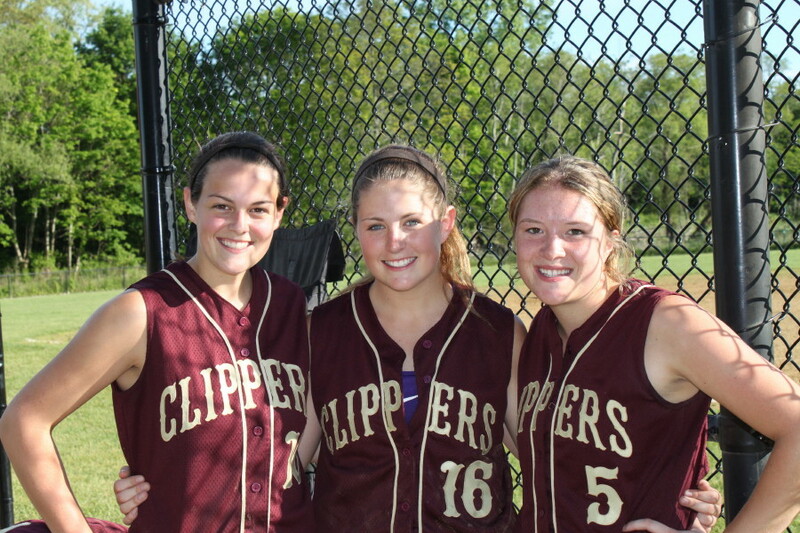 Newburyport seniors Beth Castantini, Molly Rowe, and Maddy Stanton after playing their last home game. 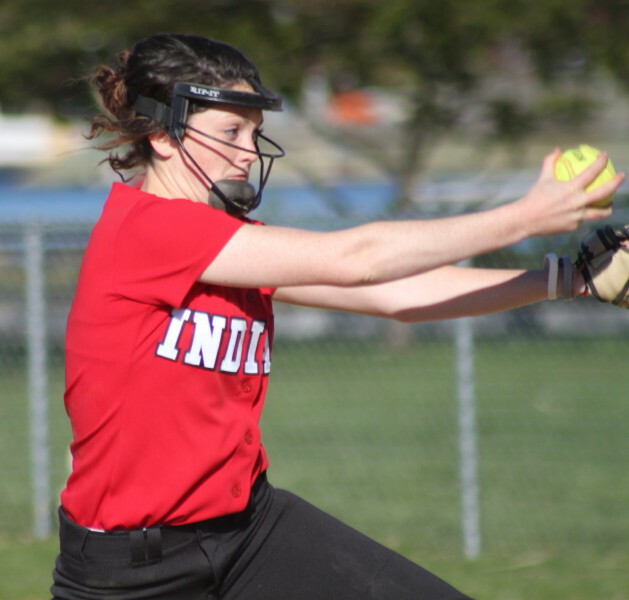 (Newburyport) The Amesbury Indians (15-4) swept the season series with Newburyport on the strength of a 7-6 win at Perkins Playground on a beautiful Wednesday afternoon in Cape Ann League softball. Newburyport (10-8) gave away five runs in the field during the first two innings but came back with their bats to nearly pull this one out in the bottom of the seventh. This was the last regular season home game for Newburyport’s three seniors (Beth Castantini, Molly Rowe, and Maddy Stanton) and they were honored by NHS coach Lori Solazzo before the game. 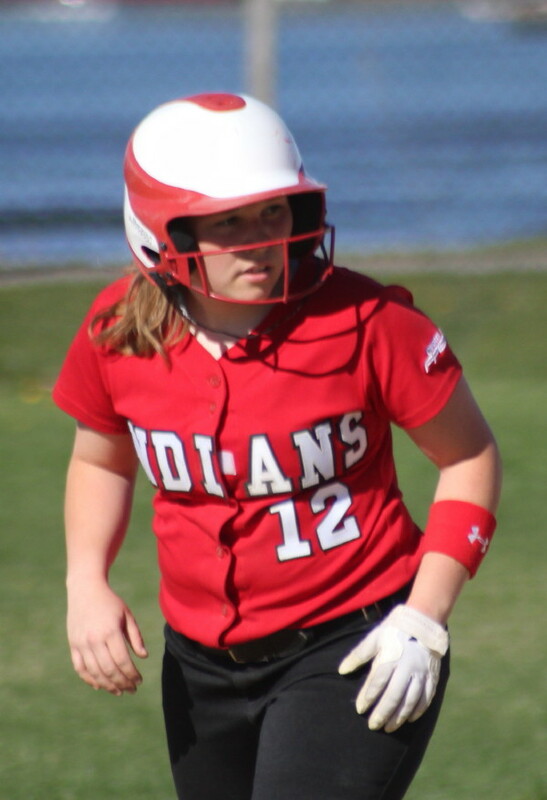 Sophomore Amanda Schell was the hitting star for the Indians collecting four RBI including two in Amesbury’s 2-run sixth. Those two runs provided the winning margin as the Clippers tallied two runs in the bottom of the seventh to get within one run. In their previous meeting, Amesbury won 9-2 on April 24th. That time around starter Carolina Merrill tossed a 4-hitter to get the victory. 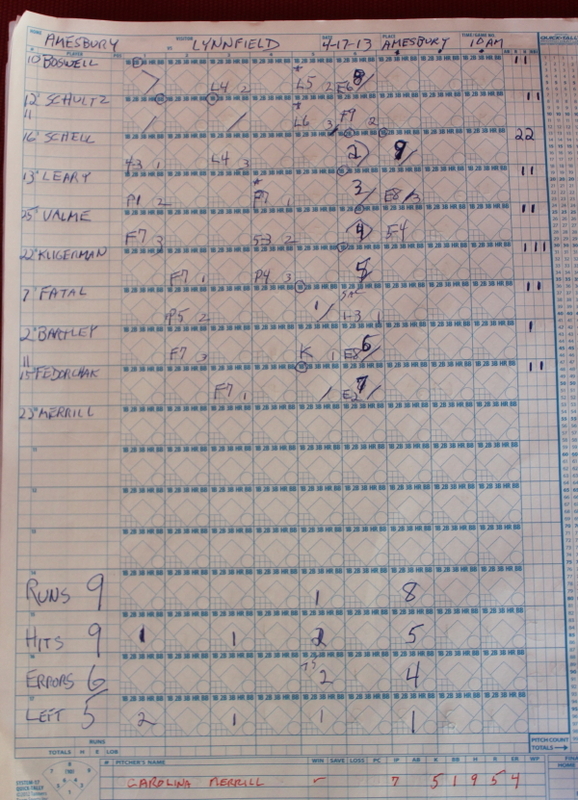 This time around Newburyport stroked thirteen hits but could never get more than two runs in an inning. The first inning was not pretty for either team defensively. I counted five throwing errors by some normally reliable infielders on both teams. Second baseman Alexis Boswell had a bobble on a potential inning-ending grounder. When the defensive dust settled Amesbury led, 4-2, after one inning. The Indians picked up another tainted run in the second. 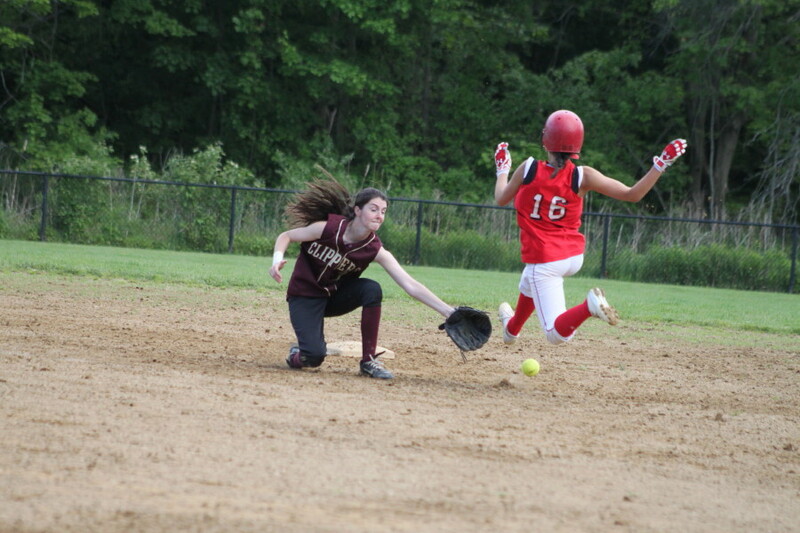 A two-out, strikeout by Molly Rowe got past catcher Lauren Singer and Janine Fatal raced home with Amesbury’s fifth run. 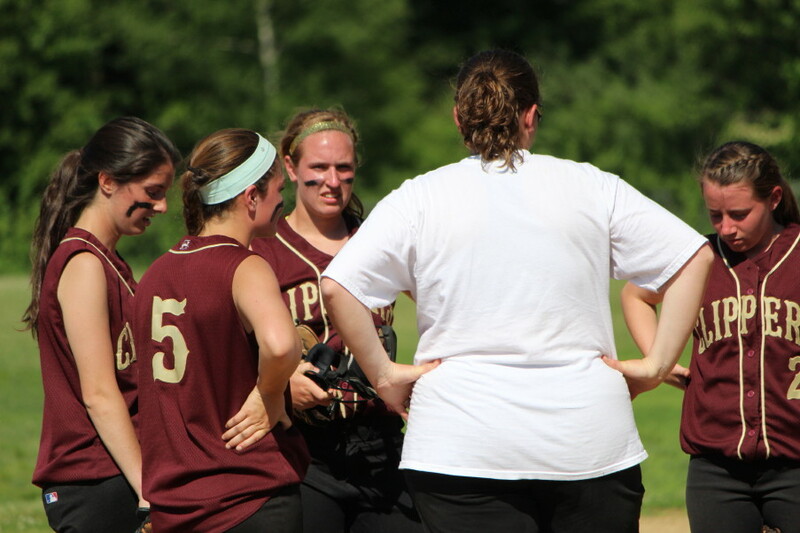 Newburyport trailed, 5-2, going into the bottom of the fourth but ran themselves out of a promising inning. A Casey Barlow single to left was followed by Lauren Singer’s single to right sending Casey to third with one out. Amy Sullivan was put in as a courtesy runner for Lauren. 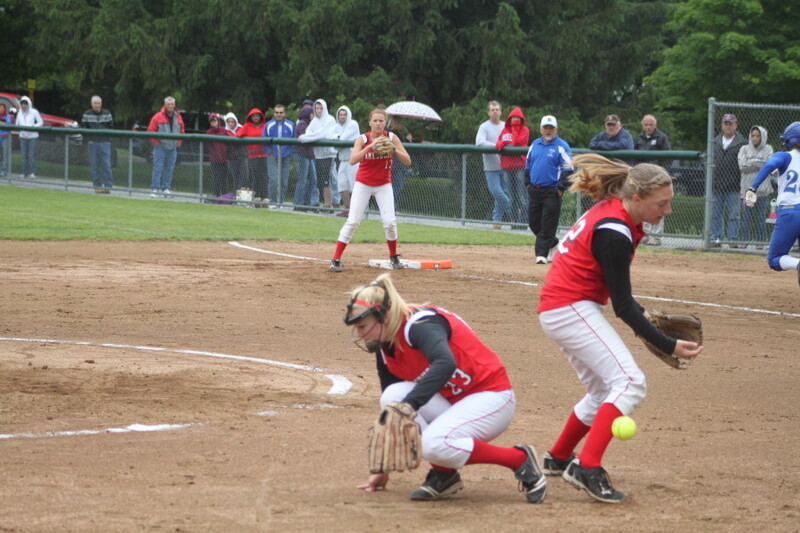 Amy tried to steal second but Indian catcher Cassie Schultz threw a strike to Amanda Schell to nab Amy. Casey Barlow broke for home as the play at second was completed and Amanda threw a strike back to Cassie getting Casey by plenty. The Clippers picked up two runs in the fifth to close to 5-4. Kendra Dow singled and reached third after two infield outs. Carley Siemasko brought Kendra home with a single to left. 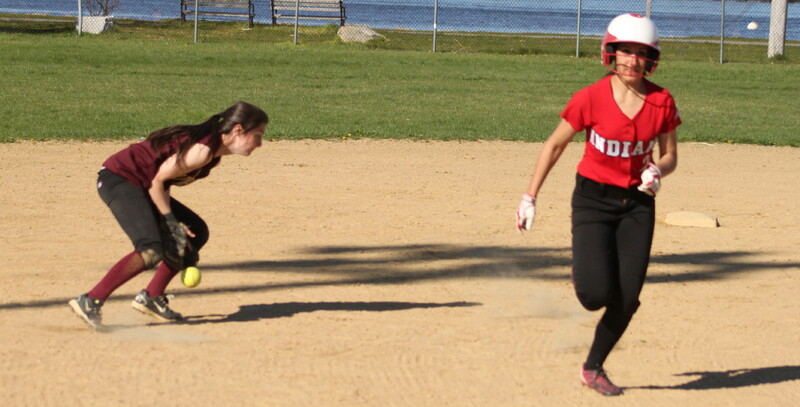 Later it was Beth Castantini delivering Lea Tomasz with a single up the middle. Amesbury answered with two runs of their own in the sixth. A walk (Rachel Cyr) and a single (Alexis Boswell) forced a Clipper pitching change as Beth Castantini replaced Molly Rowe. After Alexis stole second Amanda Schell hit a loud double to left center deep enough to score both runners. Newburyport made things interesting in their last at-bats. They got runners (Lea Tomasz and Carley Siemasko) on first and second with two outs. Senior Beth Castantini drove in Lea and fellow senior Maddy Stanton brought home Carley. But that’s where the comeback ended as AHS pitcher Carolina Merrill got Vicki Allman to pop out to first baseman McKenzie Cloutier. 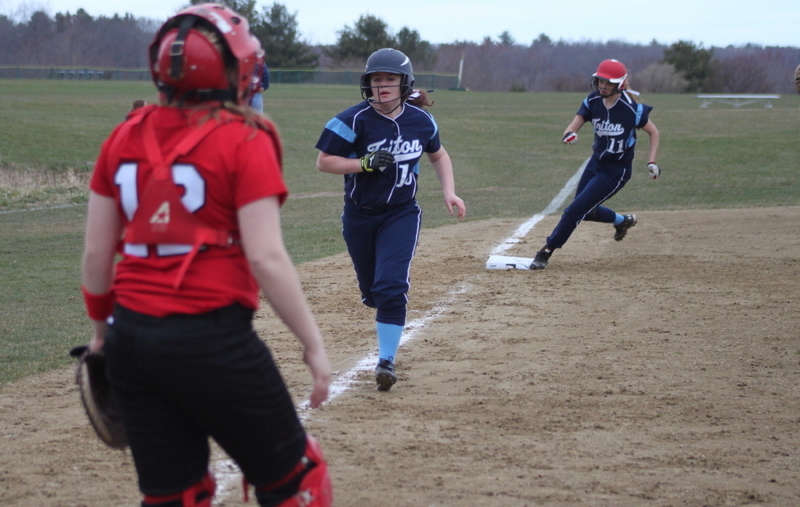 Janine Fatal and Amanda Schell each had two hits to pace Amesbury. Janine and Alexis Boswell both scored two runs. Freshman Carley Siemasko had three hits for the Clippers while Kendra Dow, Lea Tomasz, and Beth Castantini collected two hits. Beth had two RBI. 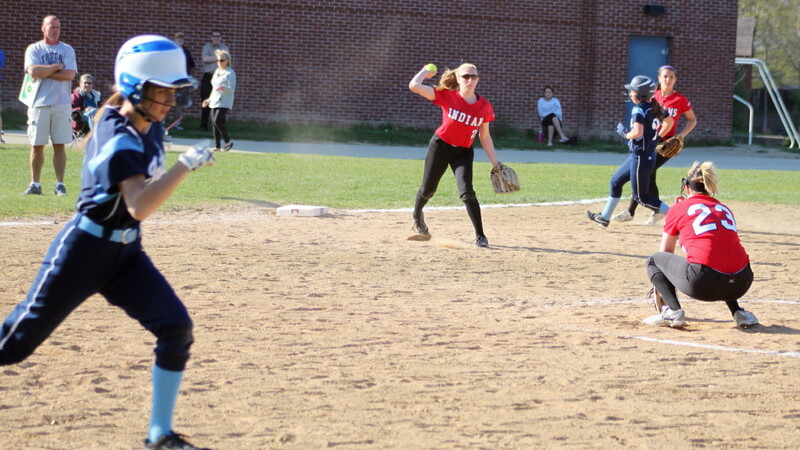 Third baseman Maddy Stanton turned a pop fly into a double play in the 4th inning. 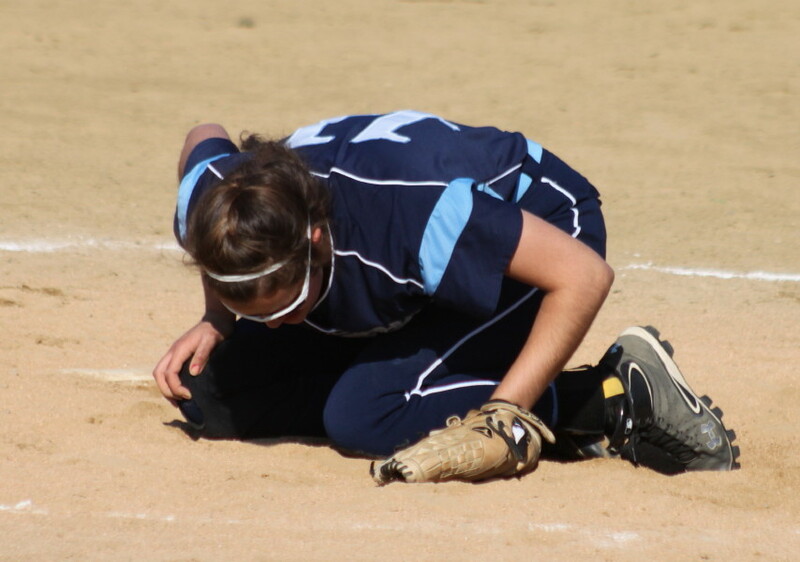 Indian pitcher Carolina Merrill had Lea Tomasz’ line drive go off her leg in the 7th inning. 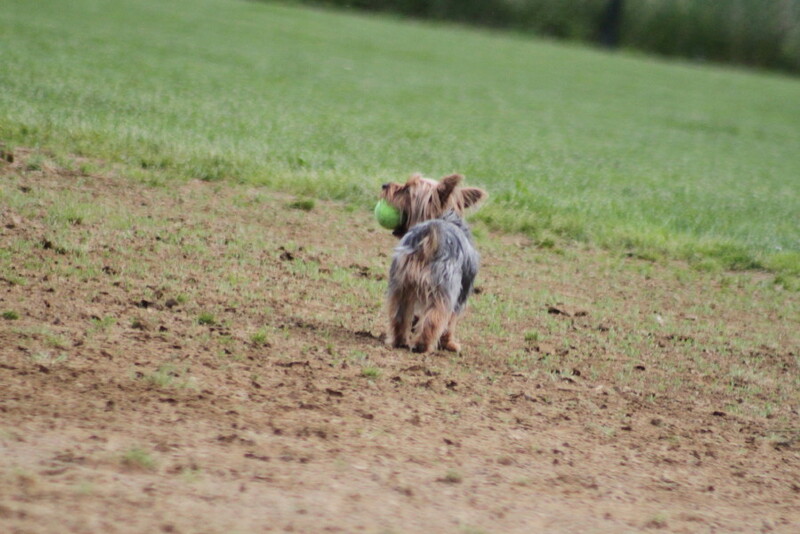 A dog joined the action in the 4th inning even bringing along his own ball. Amesbury has a 15-4 season going with no seniors. The Indians close their regular season tomorrow (Thursday) at St. Mary’s. The Clippers will be involved in the North Andover tournament starting on Friday. Both Amesbury and Newburyport have qualified for the post-season tournament. The Clippers will be playing on the road whereas the Indians may get a home game or two. I can report now that this game was not at Cashman or Bresnahan? Only an individual who had gone to both places could give you that sort of information.